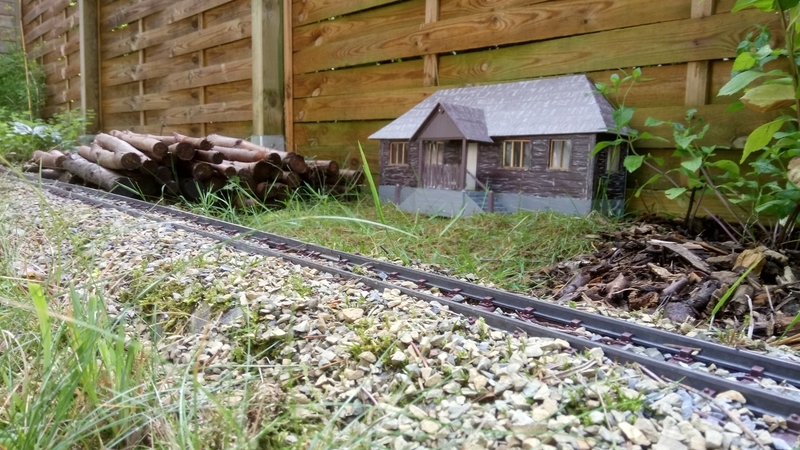 Since the wye at formerly “Strawberry Hill” turned out as some runaround and shunting station for logging railroad operations, I made use of good weather and finished the tail track. 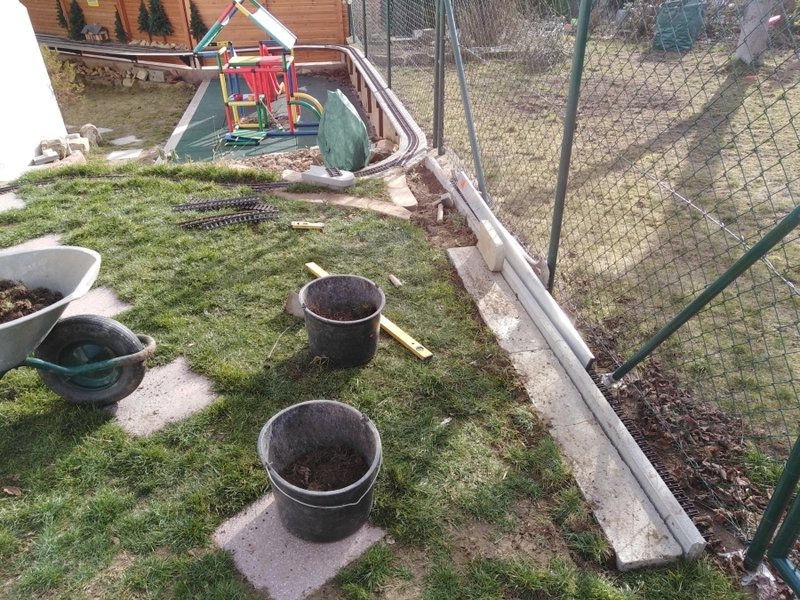 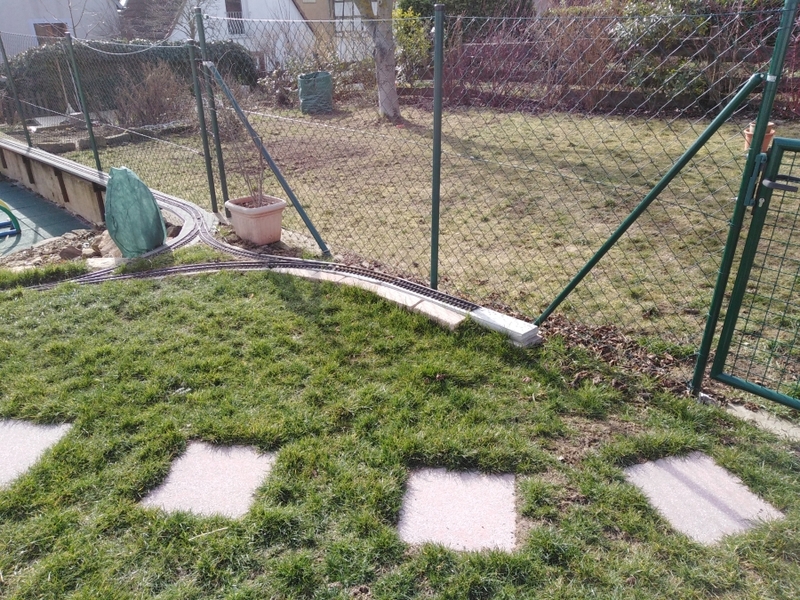 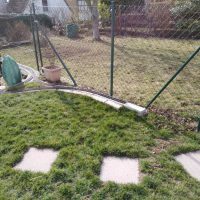 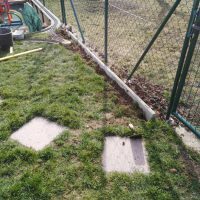 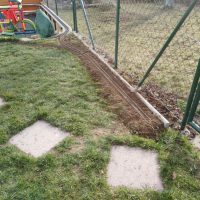 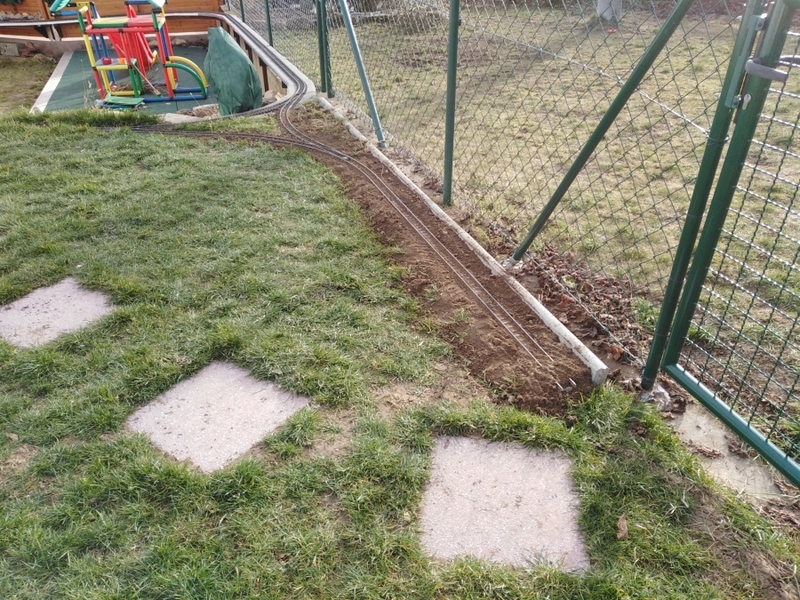 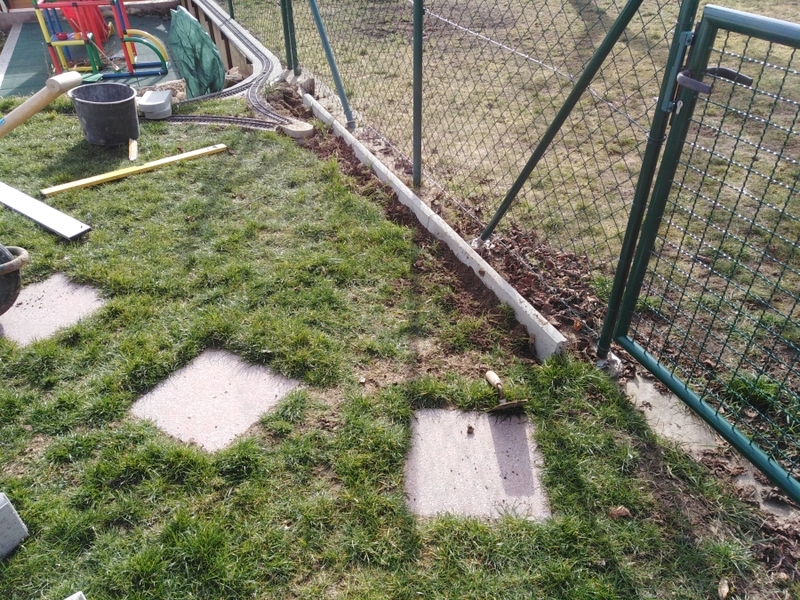 First I set some lawn edge stones along the fence foundation. 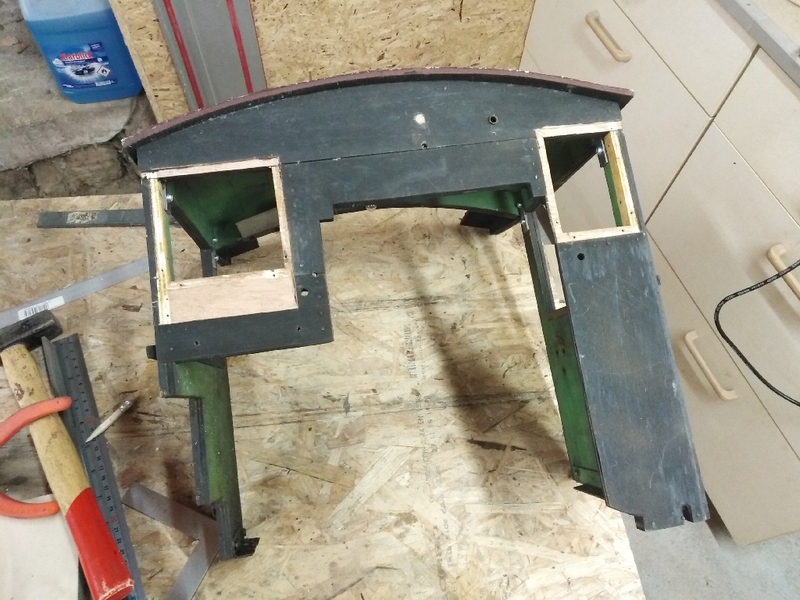 From a friend, I got two concrete window lintel and used them as base for the tail track. 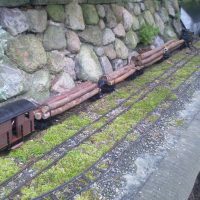 As the new tail track was a bit lower, I had to relay the bricks for the wye as well to bring them to the correct height. 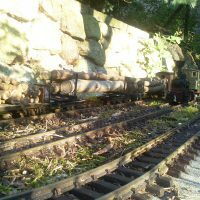 The tail track rests 1/2″ lower than the entrance turnouts of the wye, to avoid runaway trains. 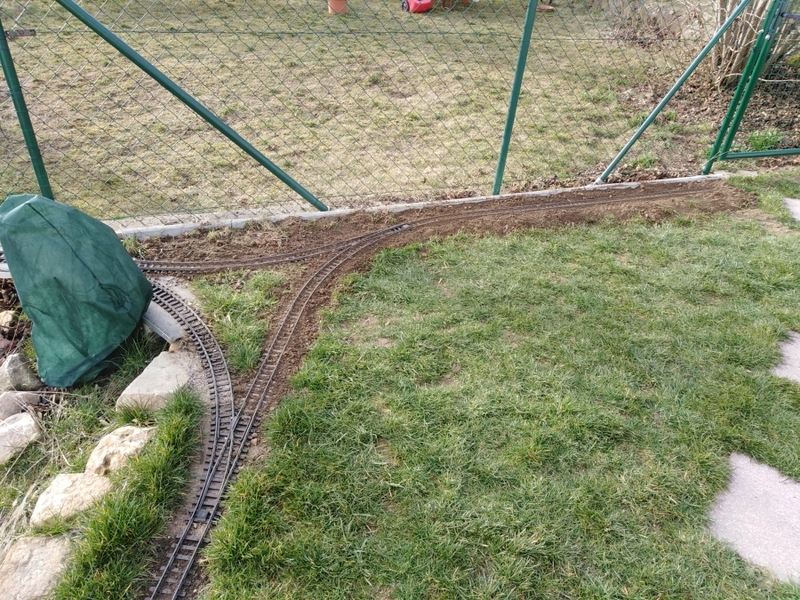 At least, I ballasted the new track with dirt. 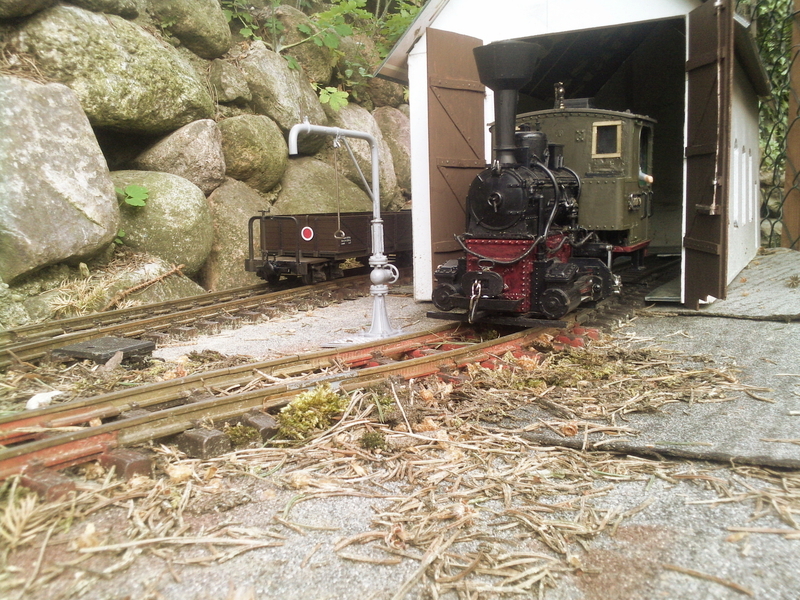 While the access to the lower turnout is very bad, I installed a switch through with rods and levers. 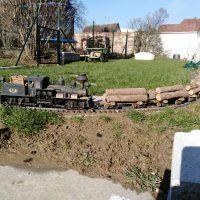 Now the wye is complete and can be used in full operation. 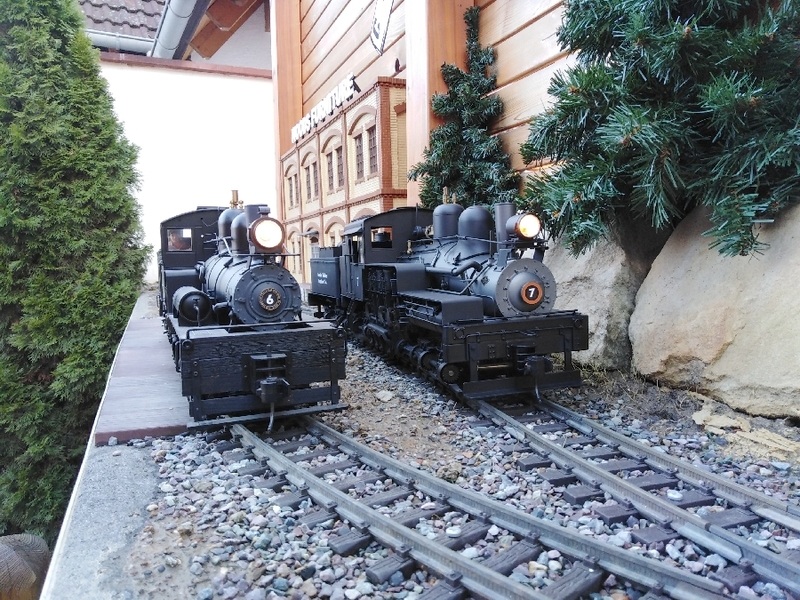 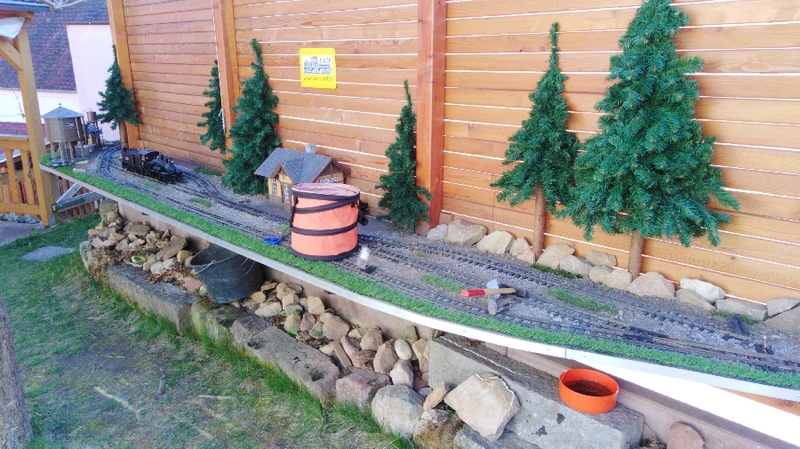 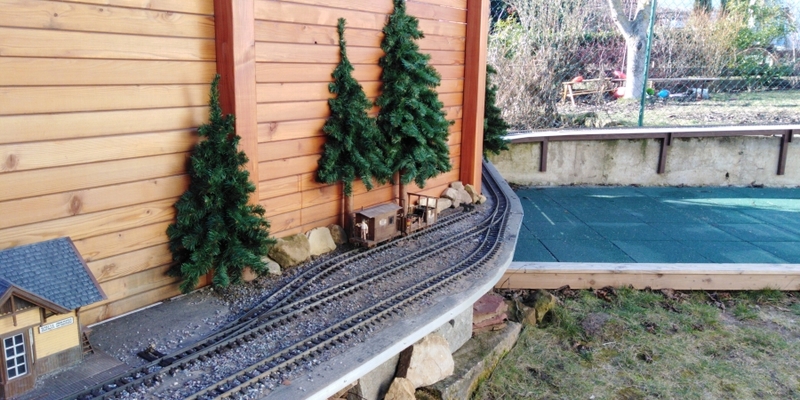 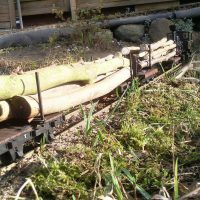 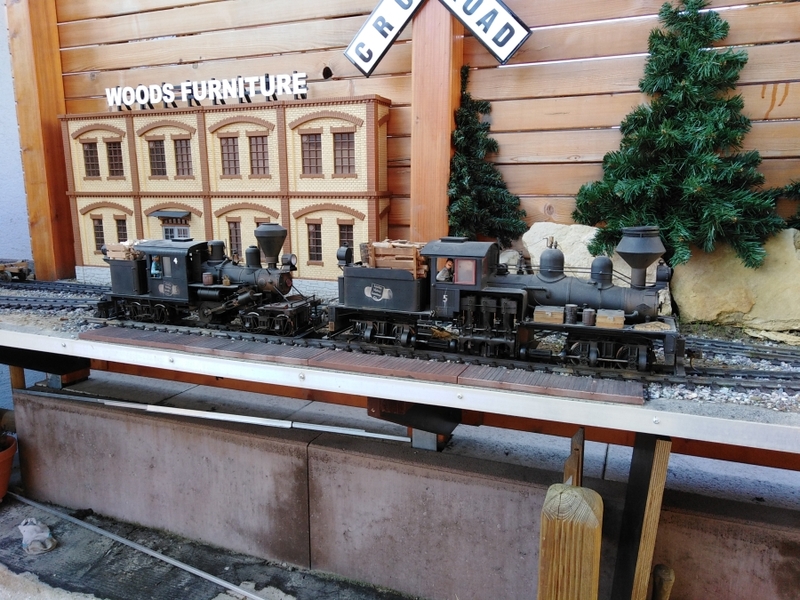 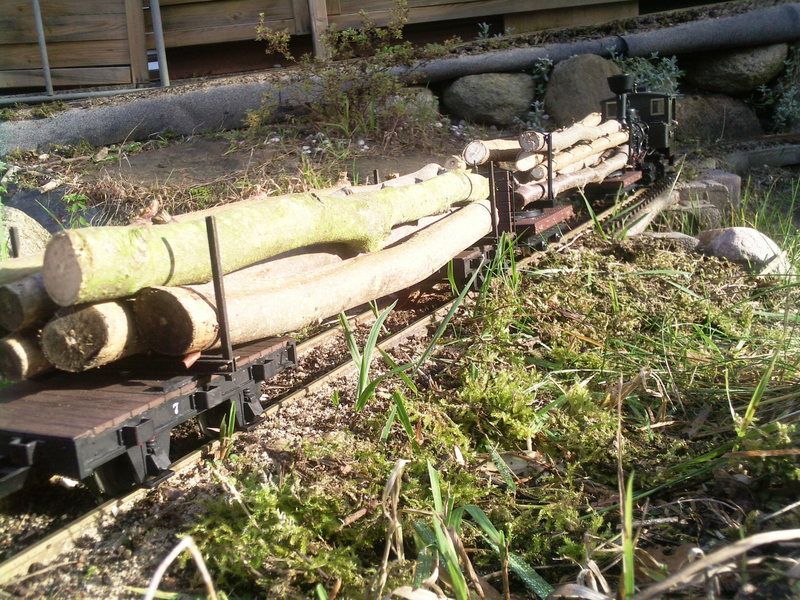 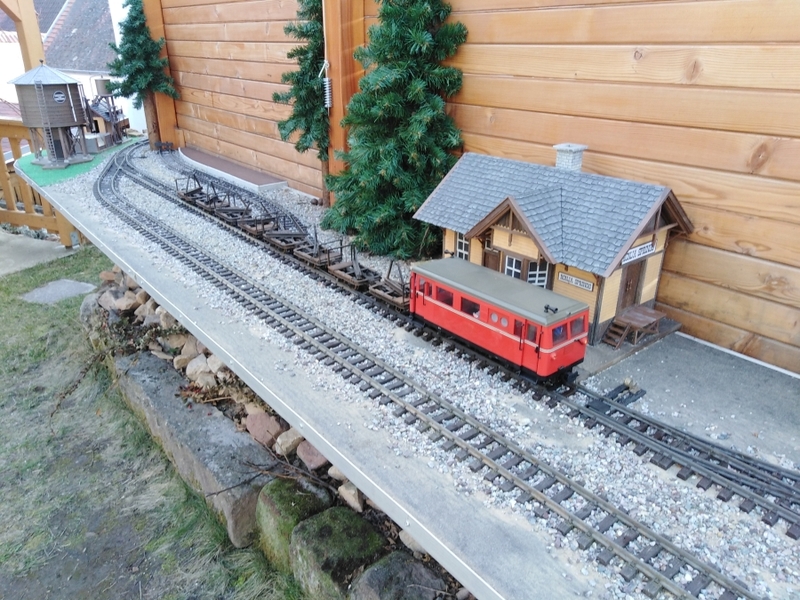 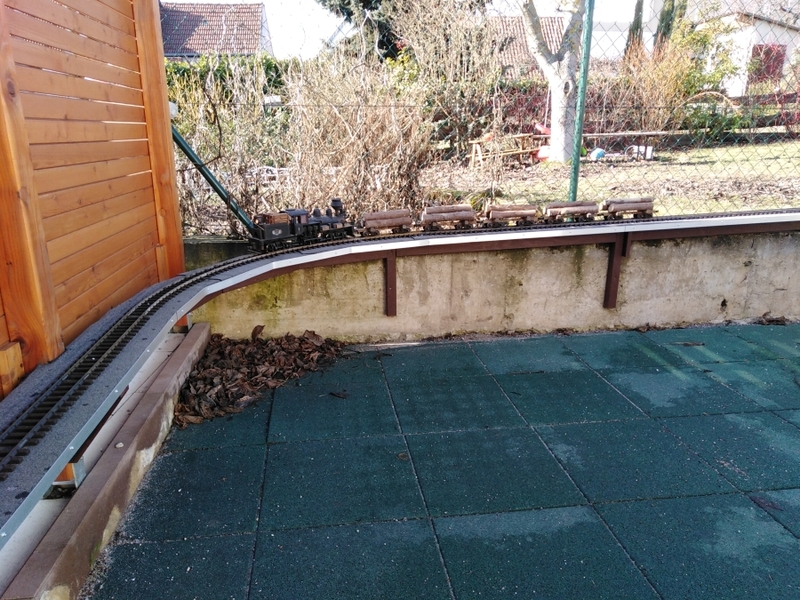 The tail track holds the maximum length of log trains (cars only – approx 7′). 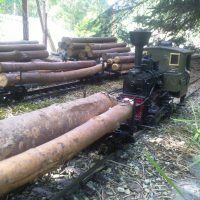 It can be used as loading spur, logging camp or just to shunt trains for the trip down to Ronja Springs. 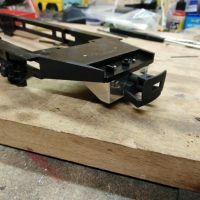 I’ll add a bumper to the end of the tracks soon. 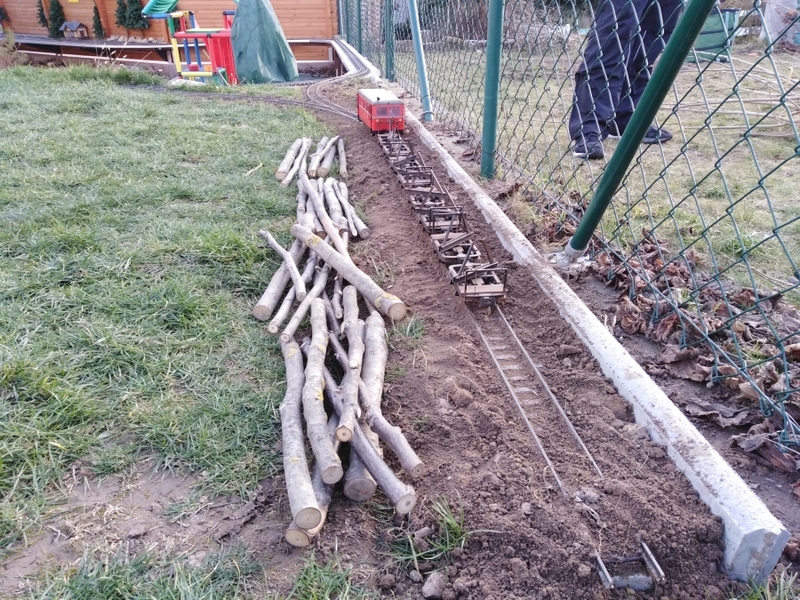 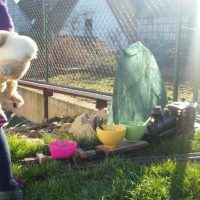 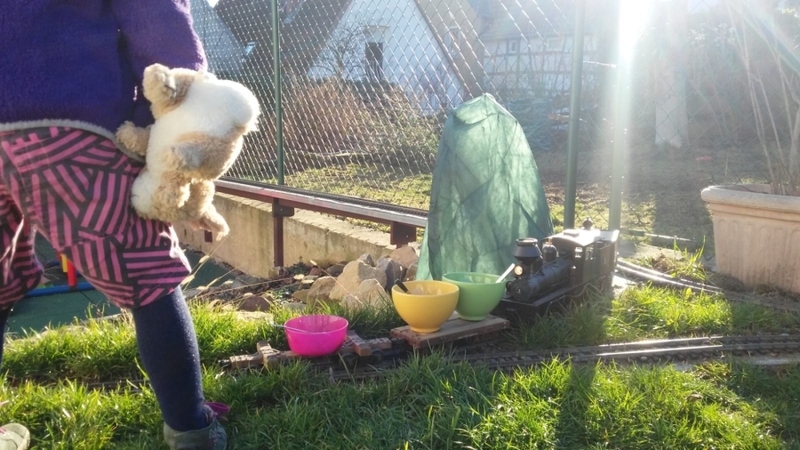 The last week, I showed you the logging railroad by Tobias. 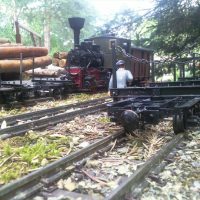 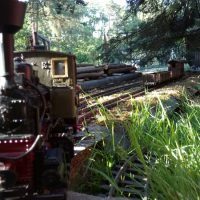 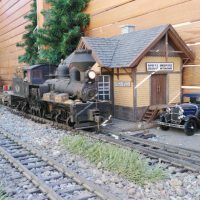 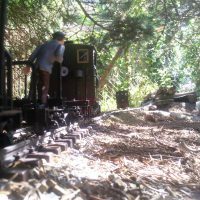 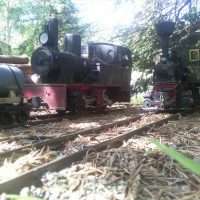 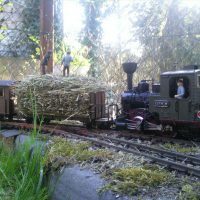 Afterwards I had a look into old photos of my first logging railroad and realized, that I’ve lost my original principles in modelling logging railroads during the last years. 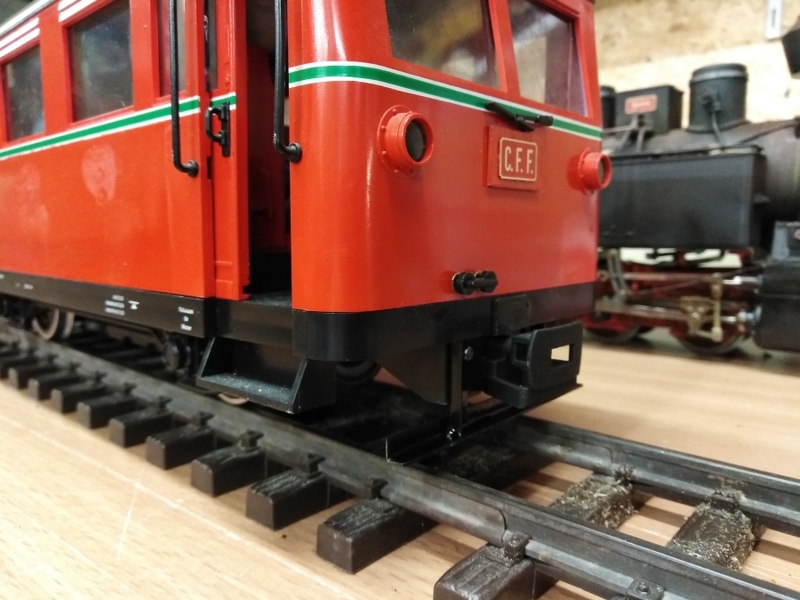 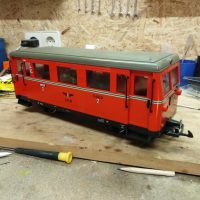 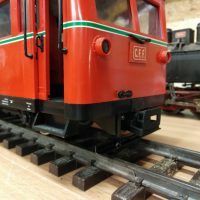 Being “cheeky”, it had some analogy with the railbus used on the Moldovita line and in the next second “crazy” took the scepter and I bought the railbus. 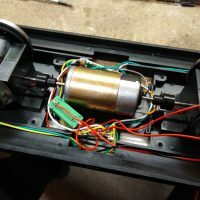 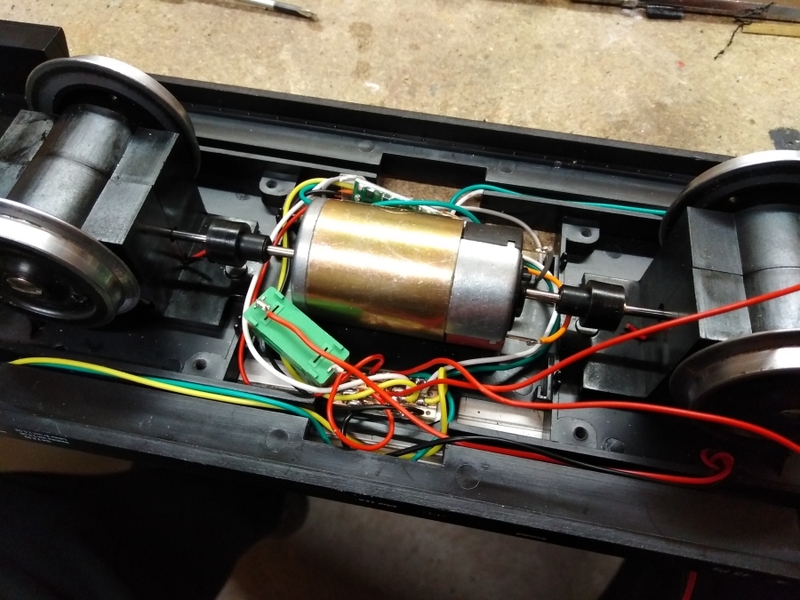 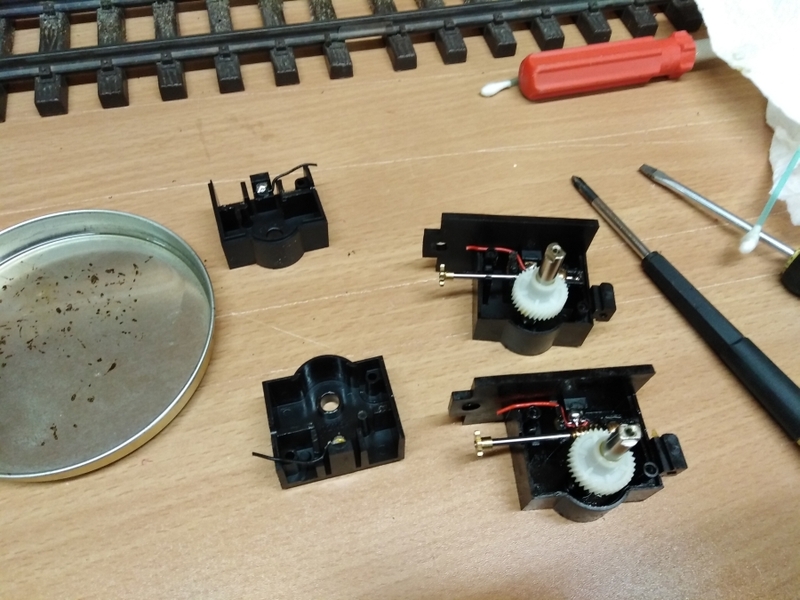 Once arrived, he came in contact with my “rebellion”… First I cleaned the gear boxes from old grease and replaced the electric stuff with Deltang and battery. 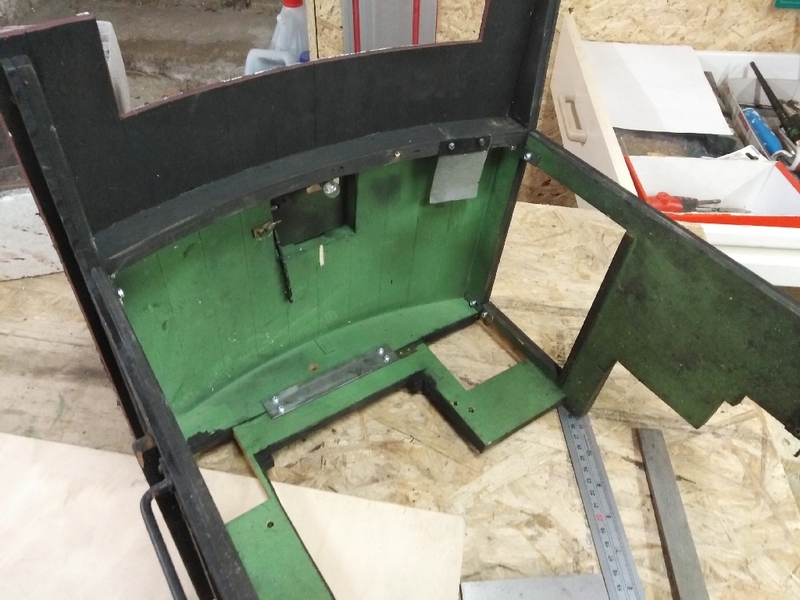 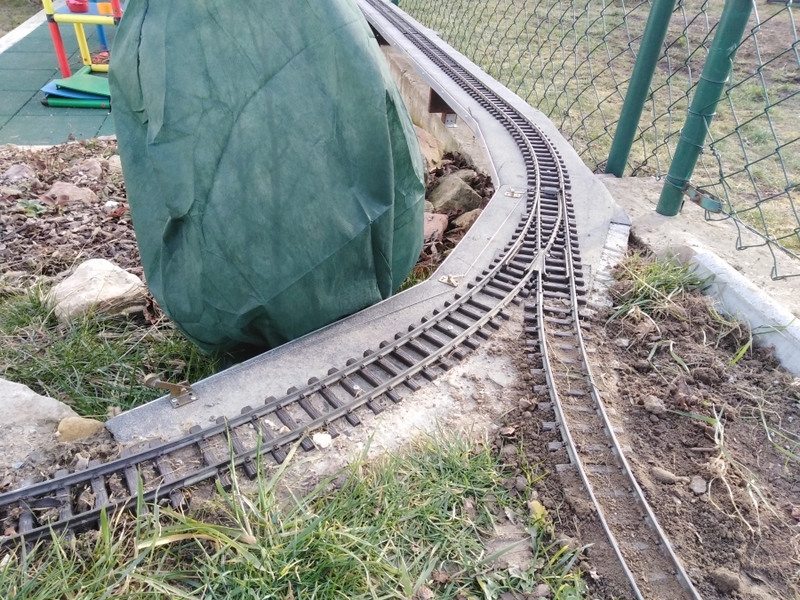 As my layout features 4′ minimum radius, I locked the swinging gear boxes in place. 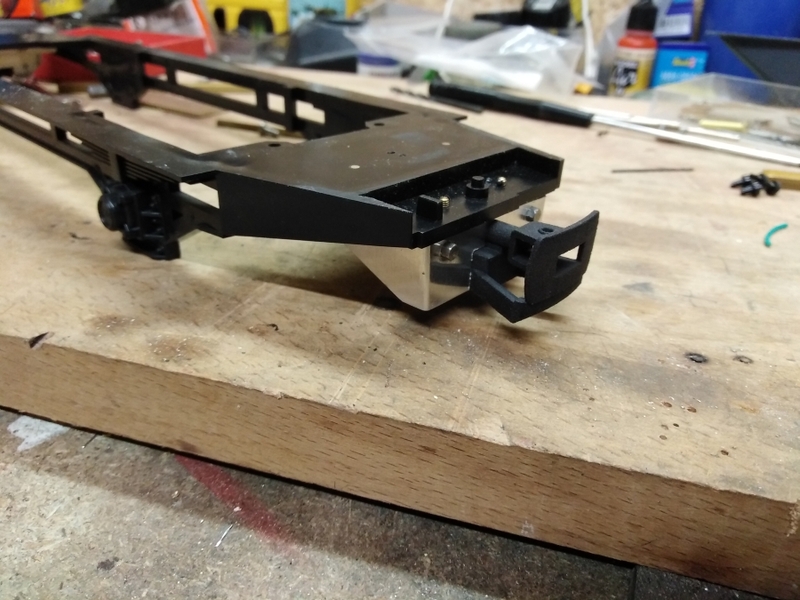 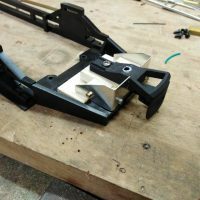 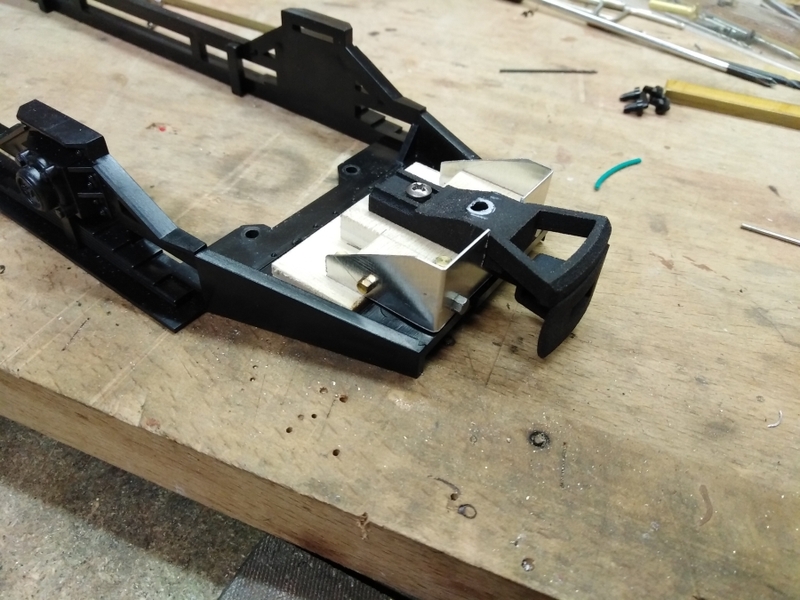 I added new coupler mounts to the frame with my own CFF-couplers and some rail guards. 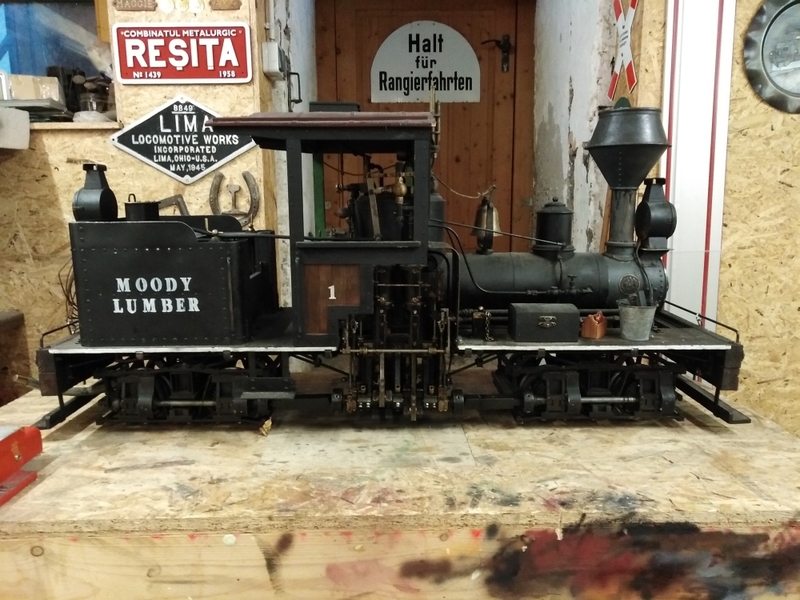 The body itself got only a few changes. 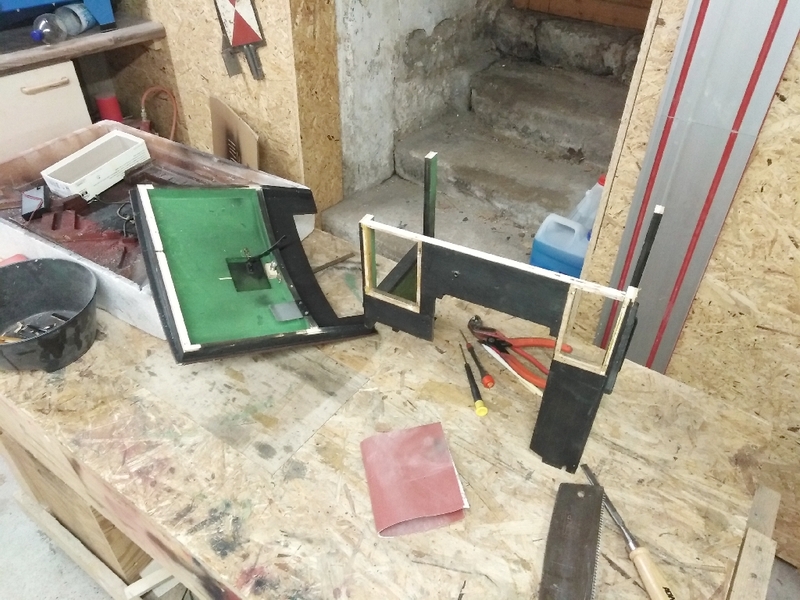 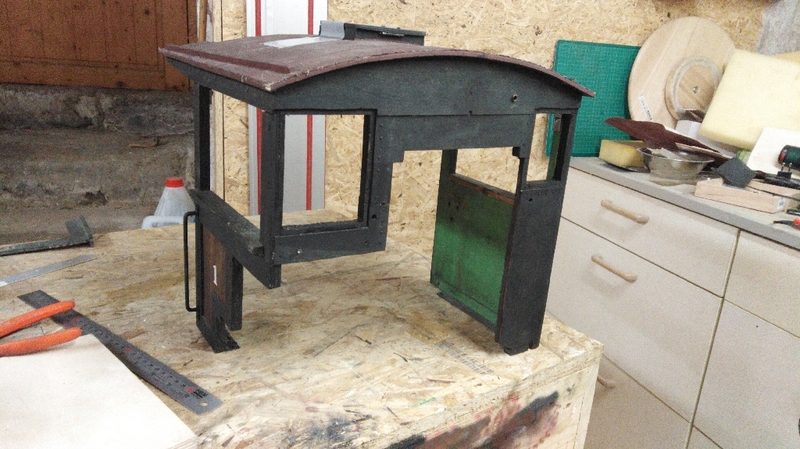 I removed all the lettering and installed some compartment for the battery with bull’s-eye windows. 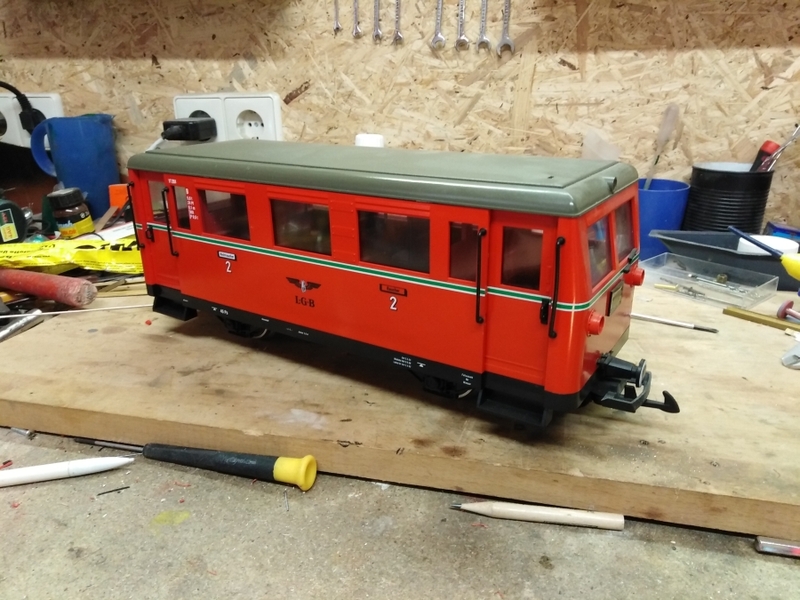 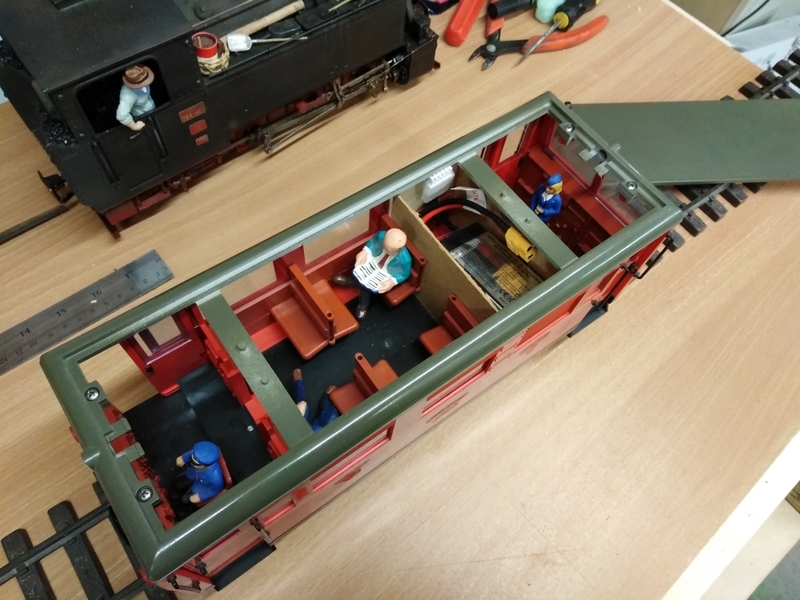 After just 2 days, the new railbus was ready for first service. 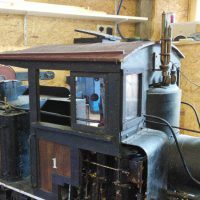 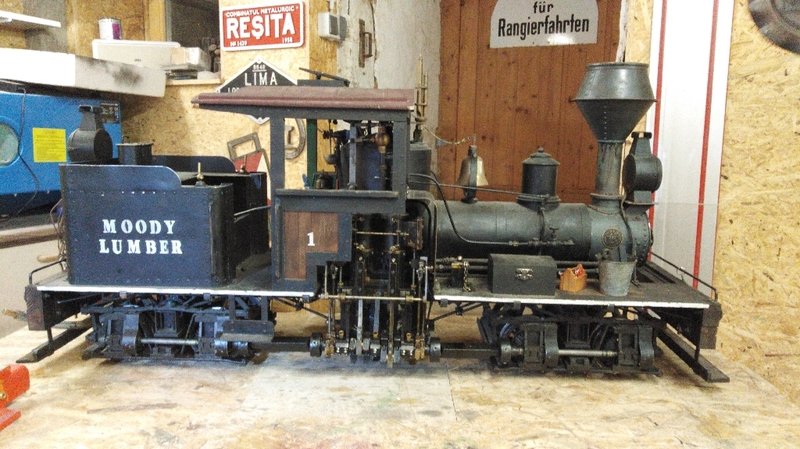 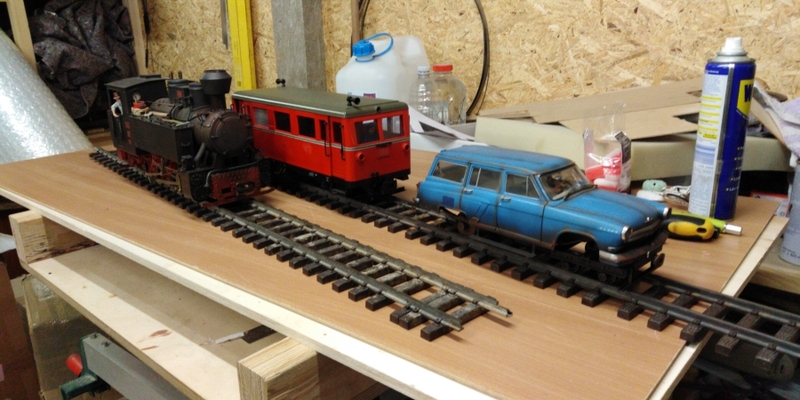 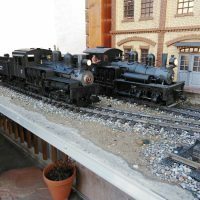 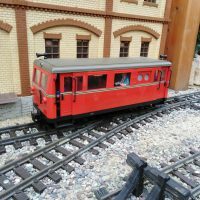 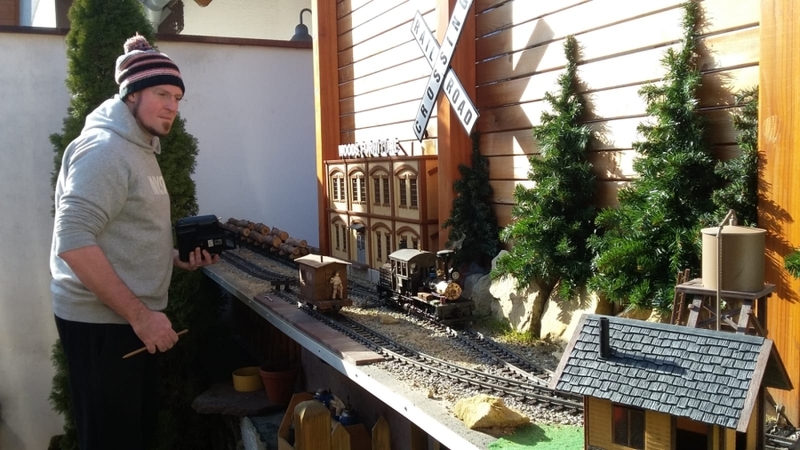 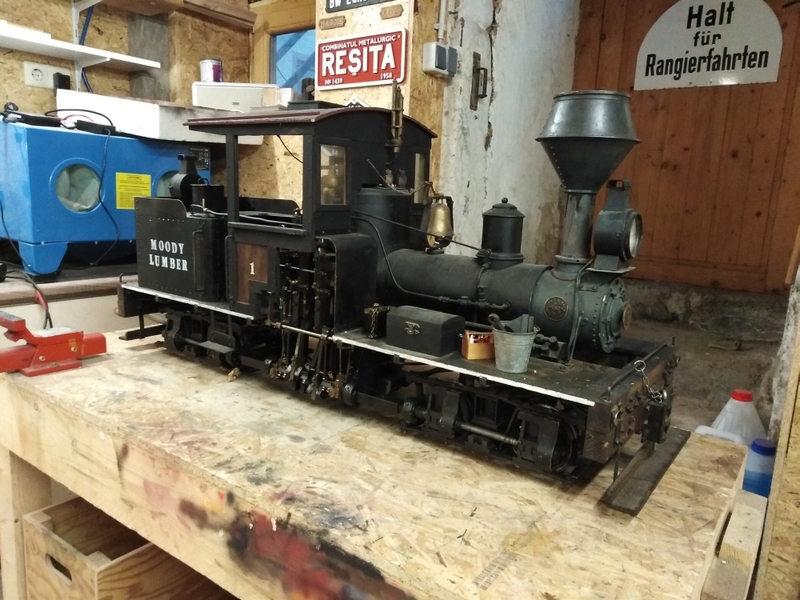 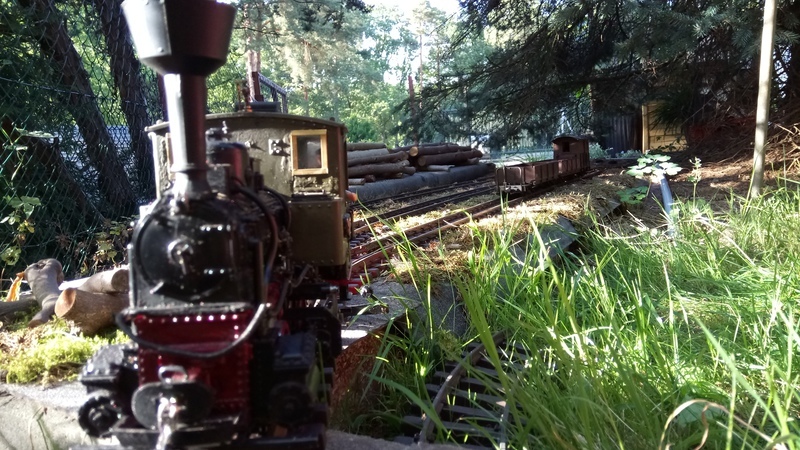 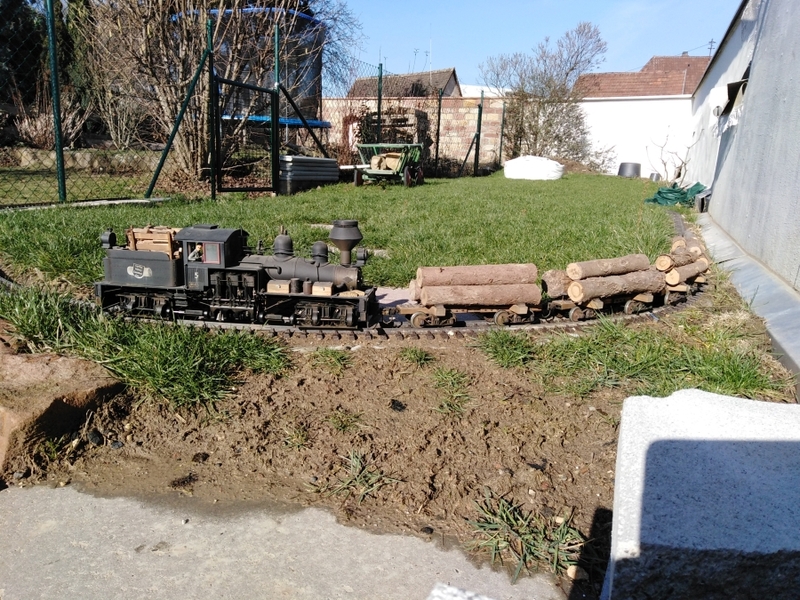 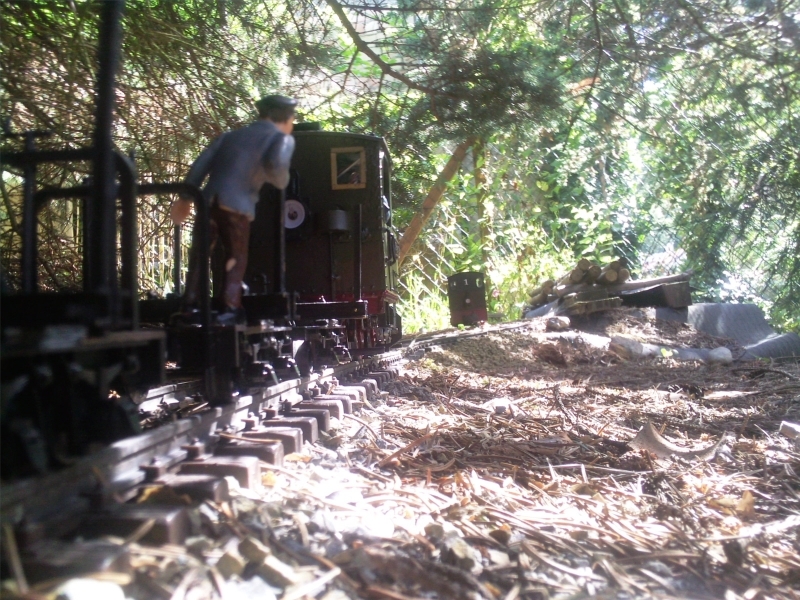 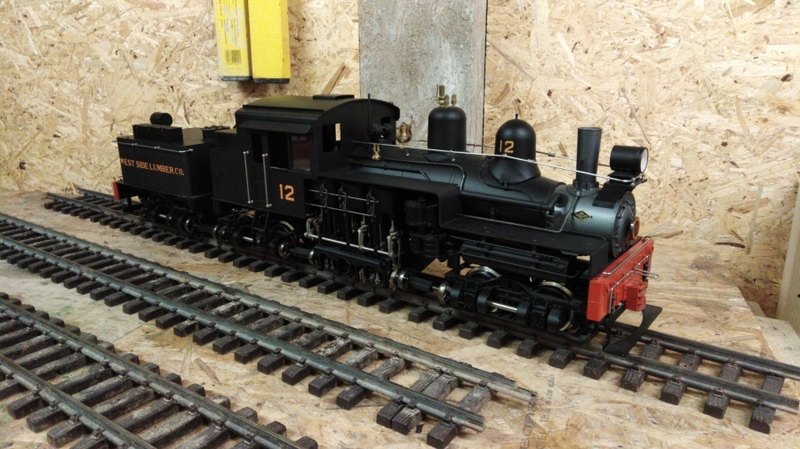 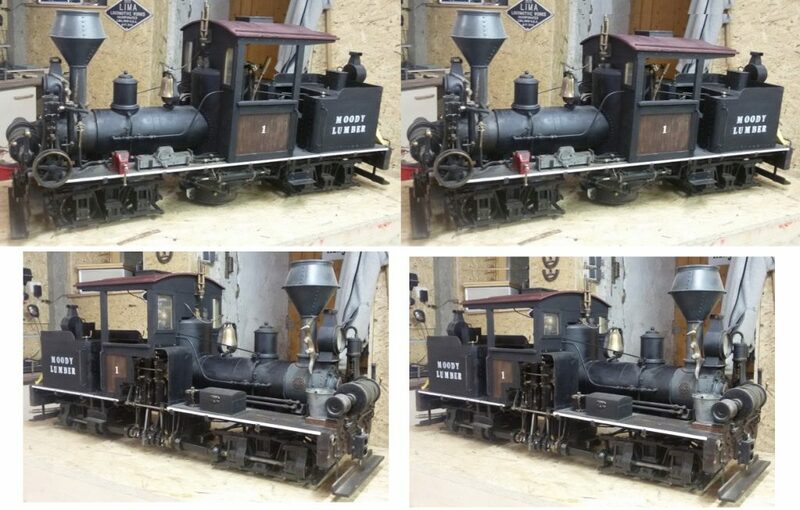 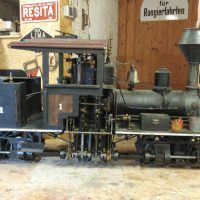 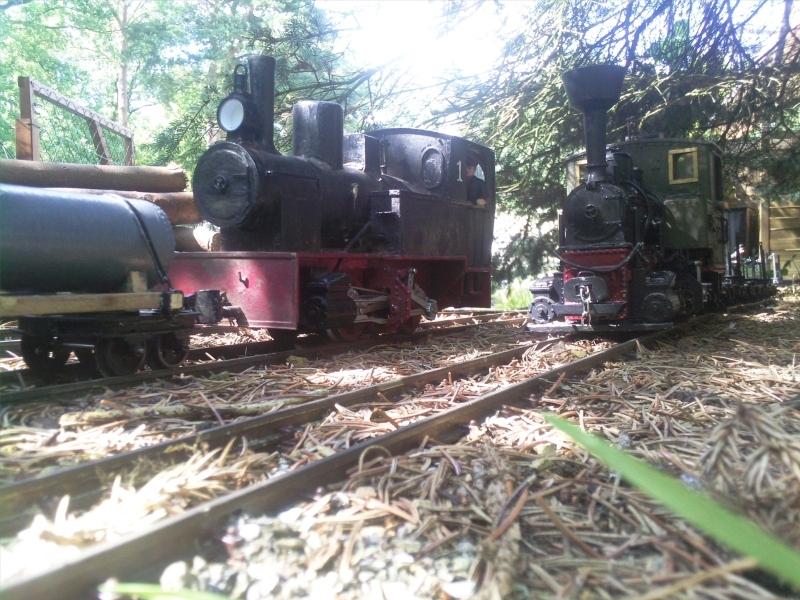 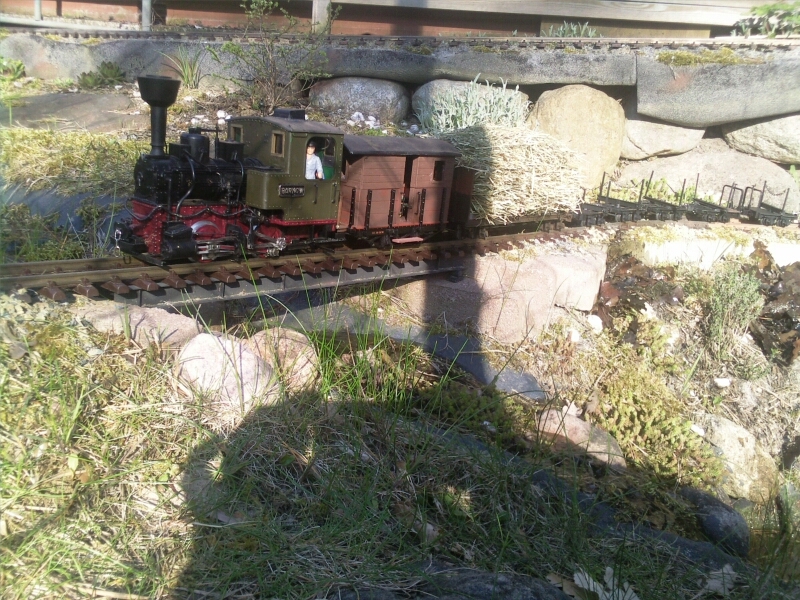 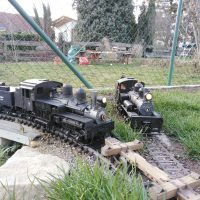 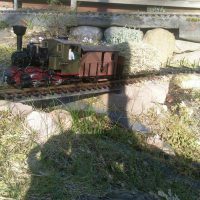 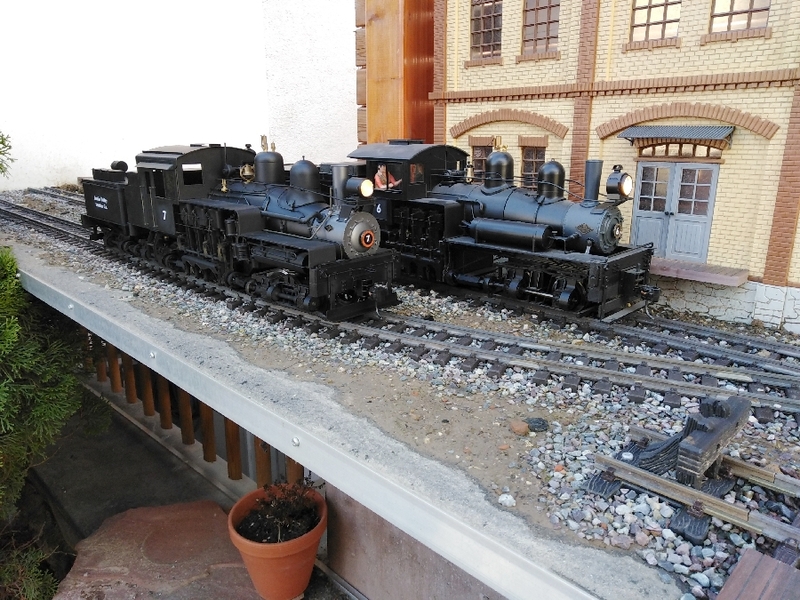 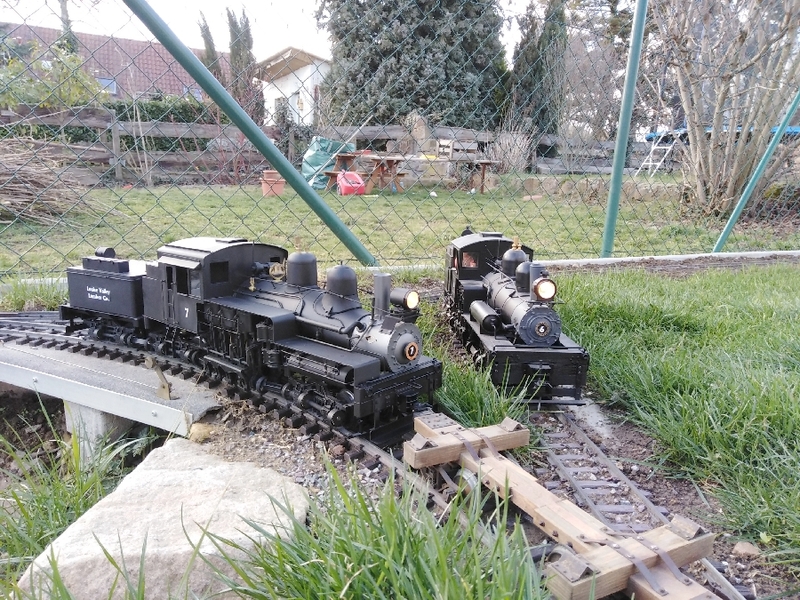 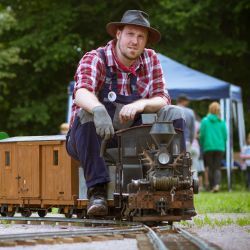 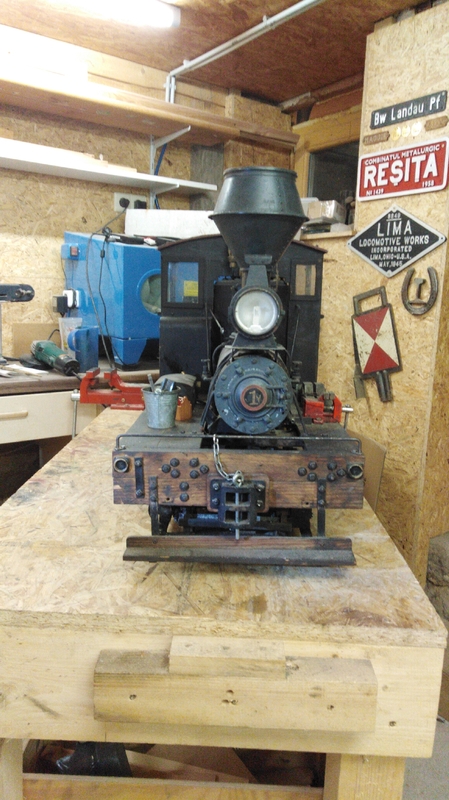 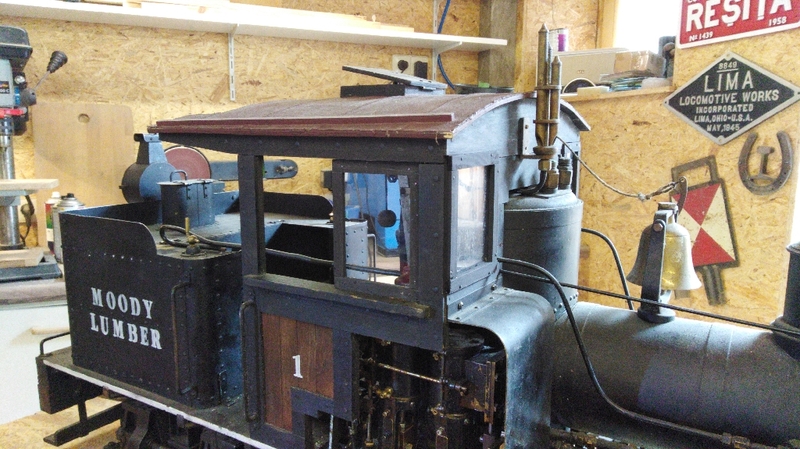 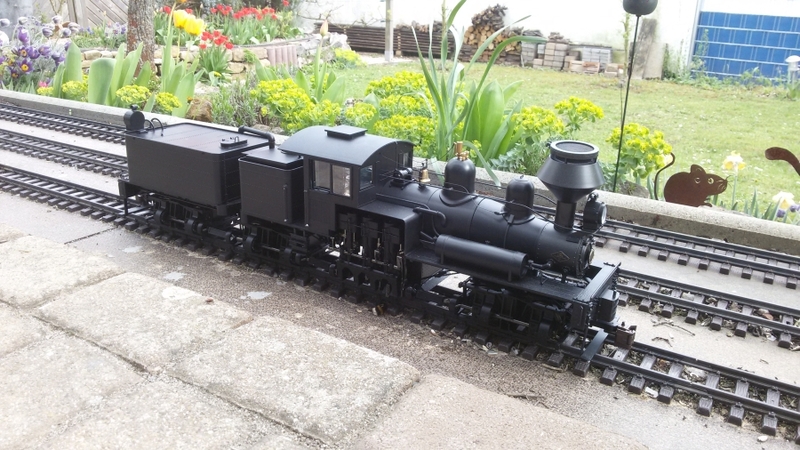 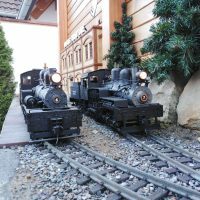 Now I’ve a battery-powered loco in addition to my live steam Resita. 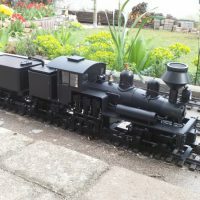 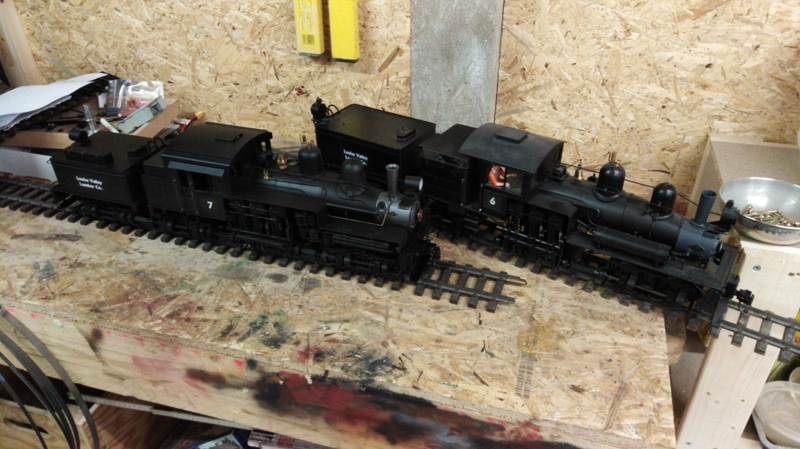 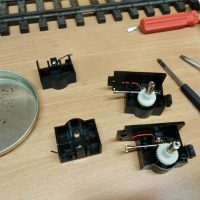 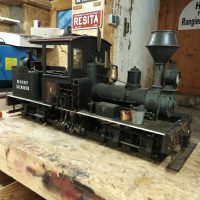 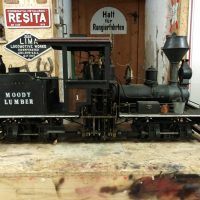 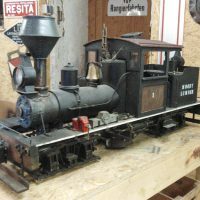 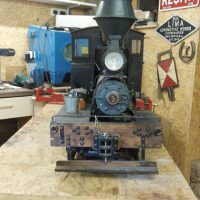 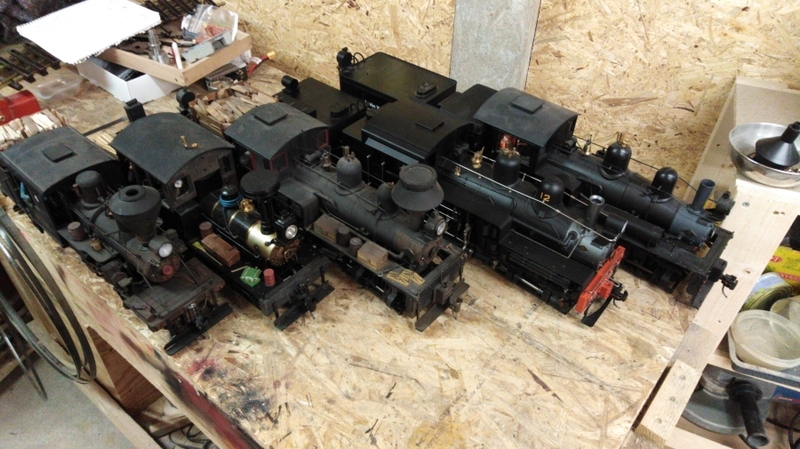 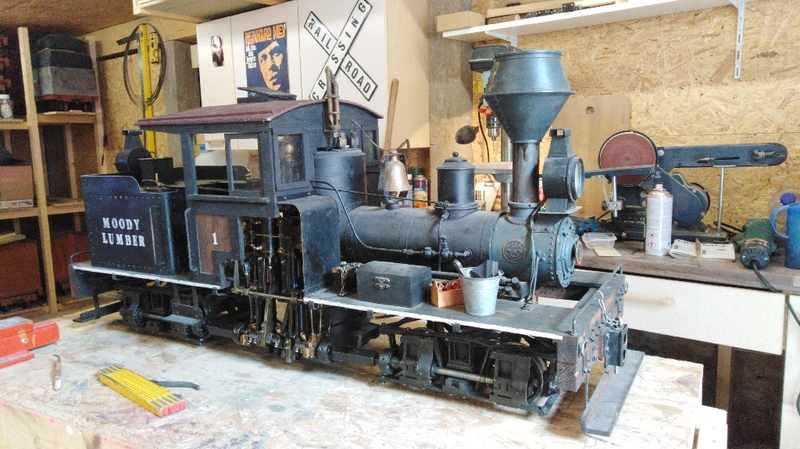 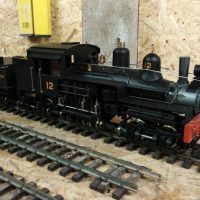 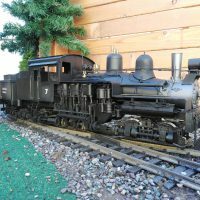 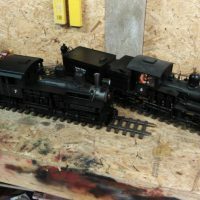 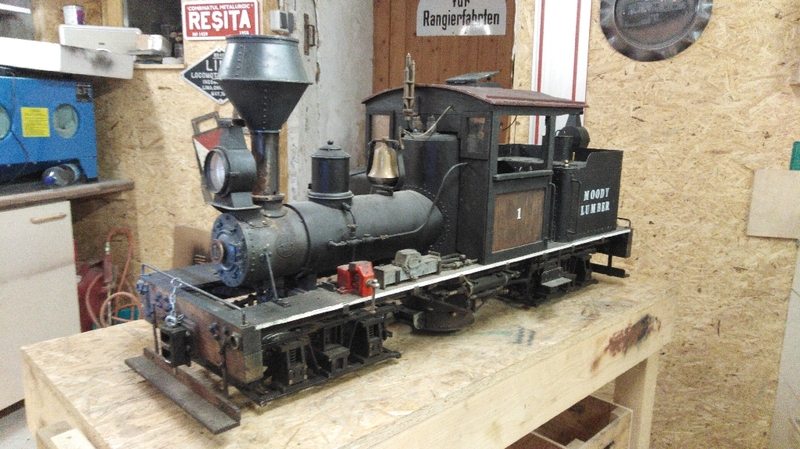 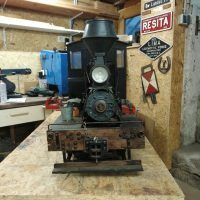 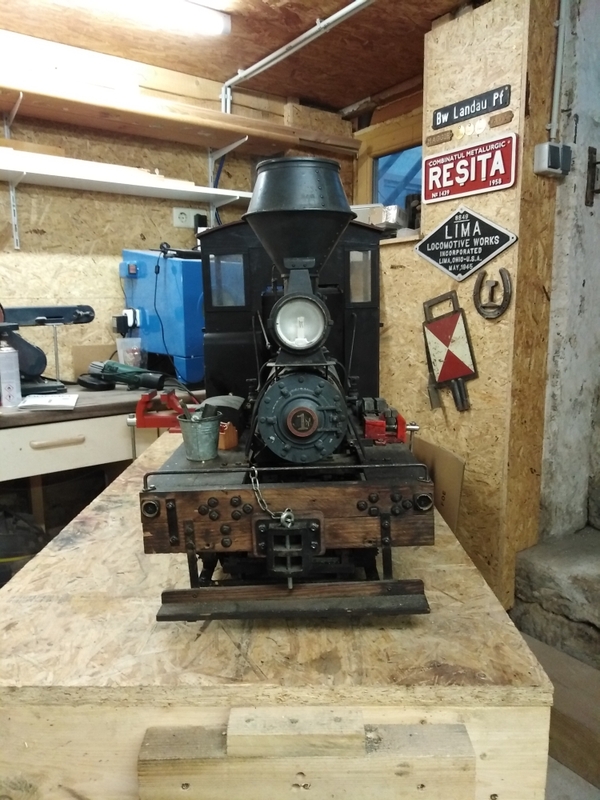 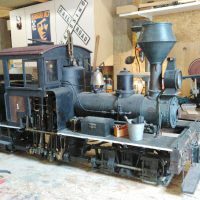 Maybe I’ll build another steam loco with battery power as well? 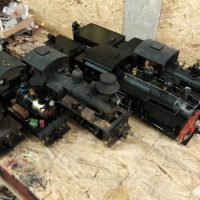 It would round the roster very nicely. 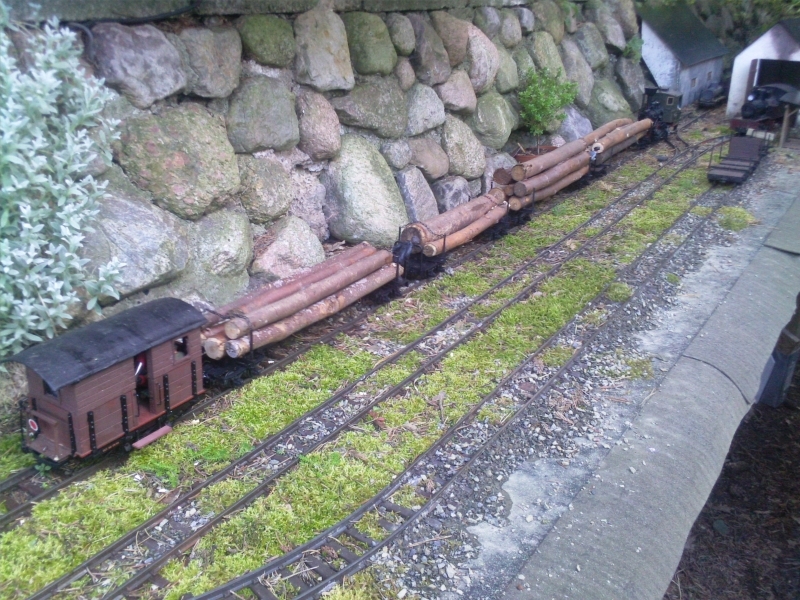 BTW, the railbus is very strong and can haul 4 loaded log cars up the hill with ease. 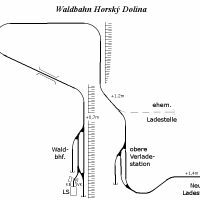 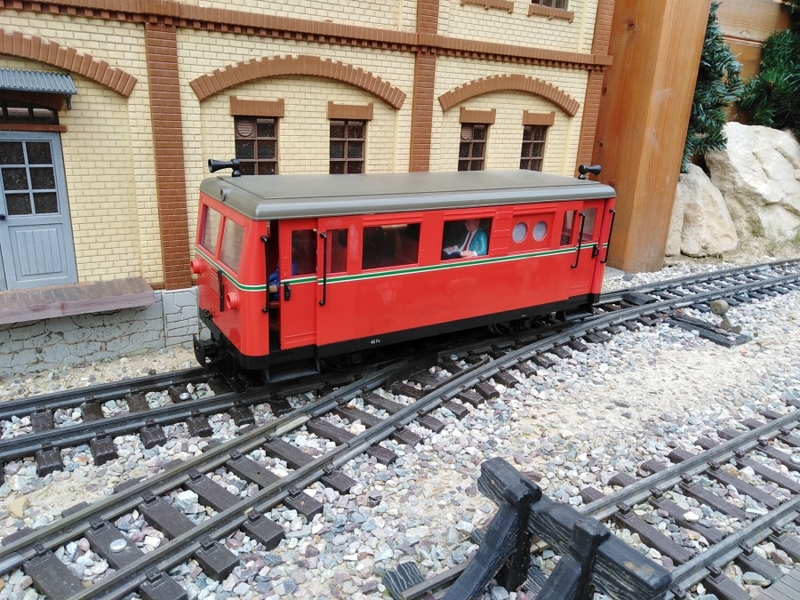 The railbus at Moldovita was also used to haul log trains along the plain sections of the line. 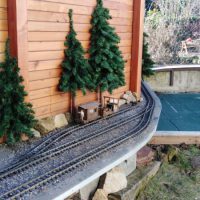 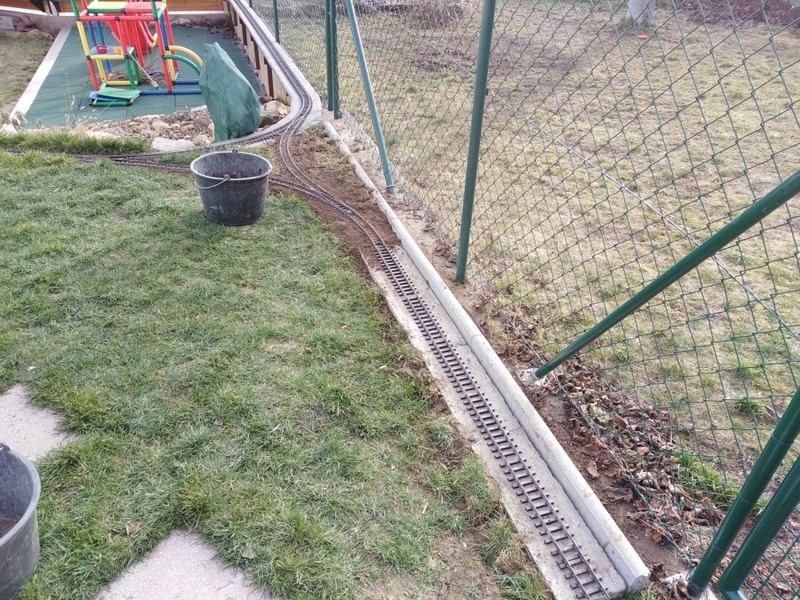 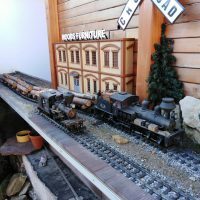 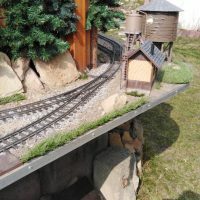 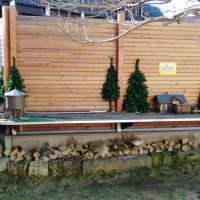 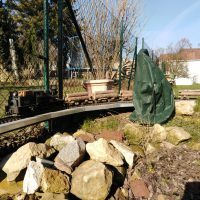 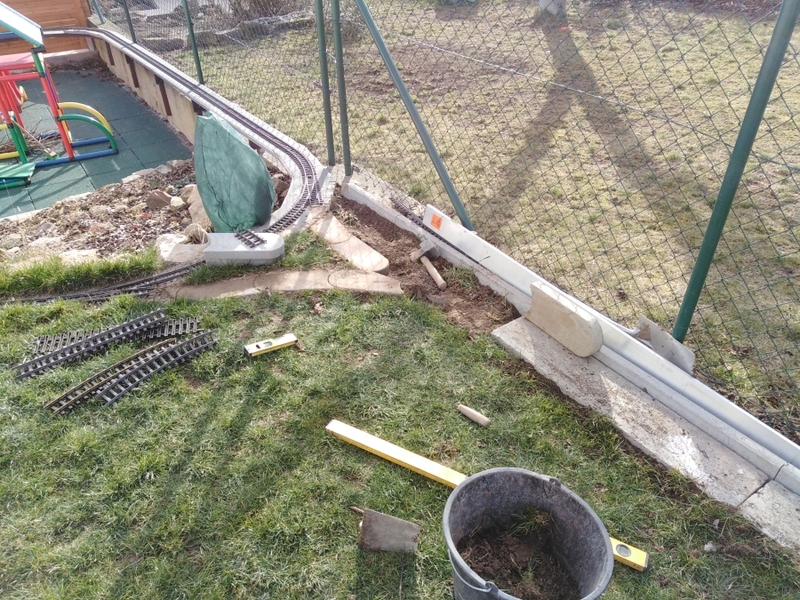 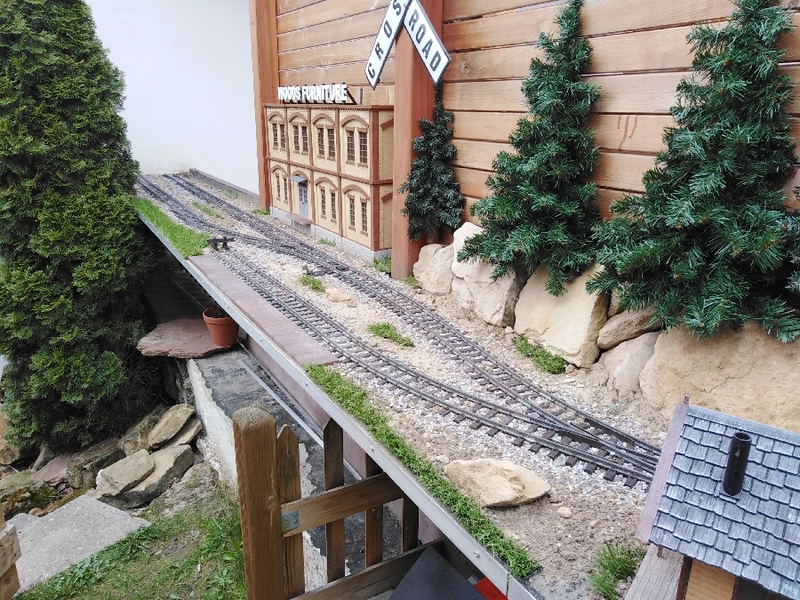 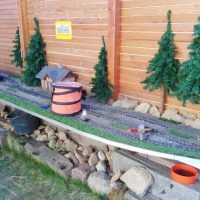 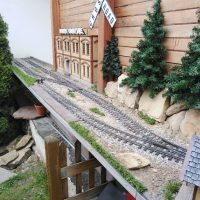 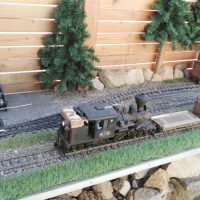 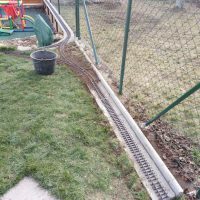 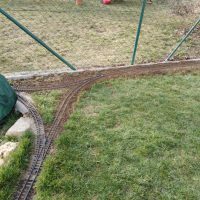 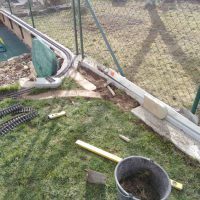 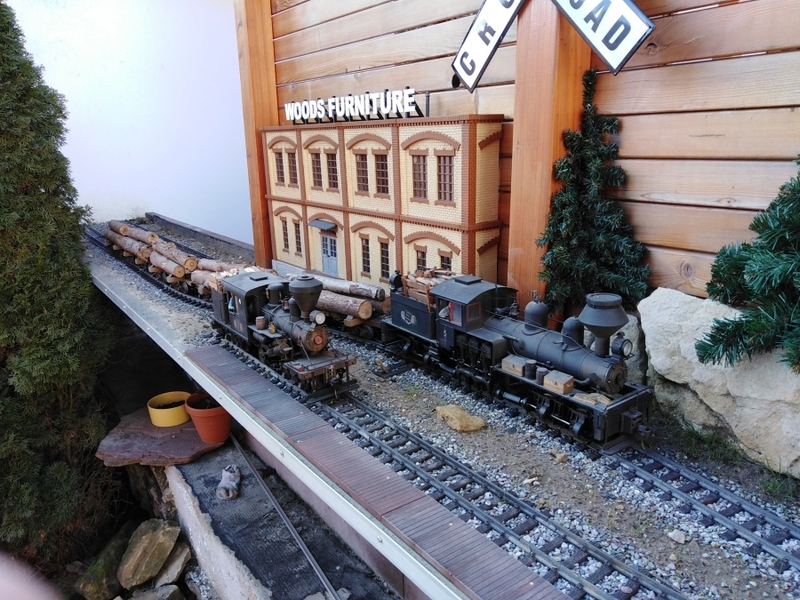 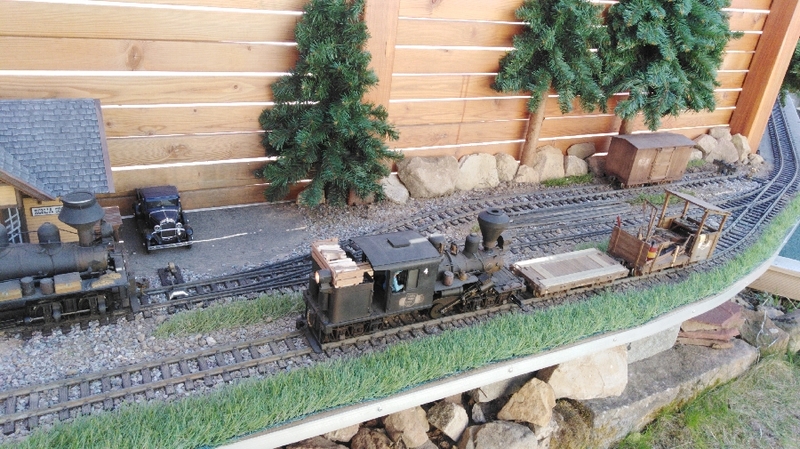 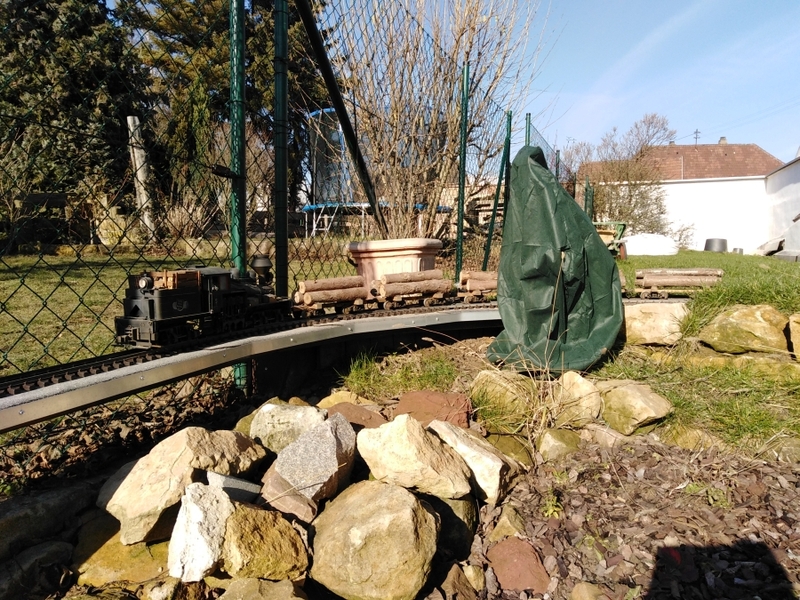 In an unused corner of our property, I build a small “operation layout” for my garden railroad trains. 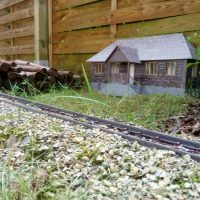 As I’m interested in logging and industrial light railroads, I decided to build a logging railroad. 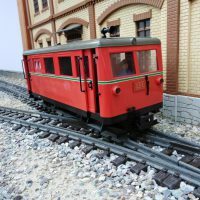 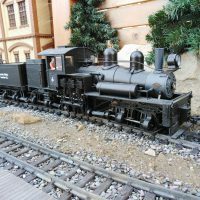 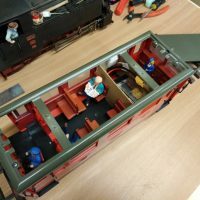 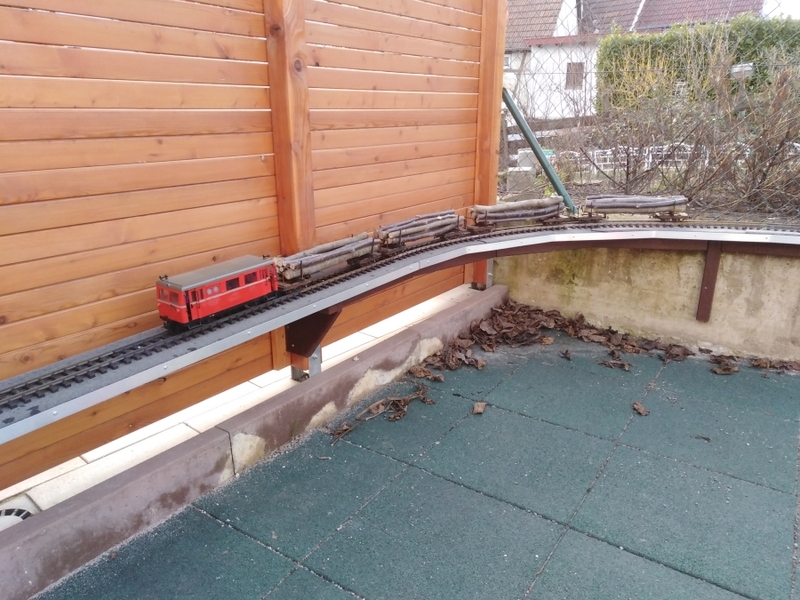 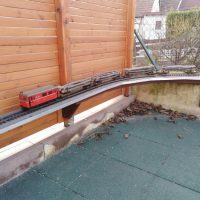 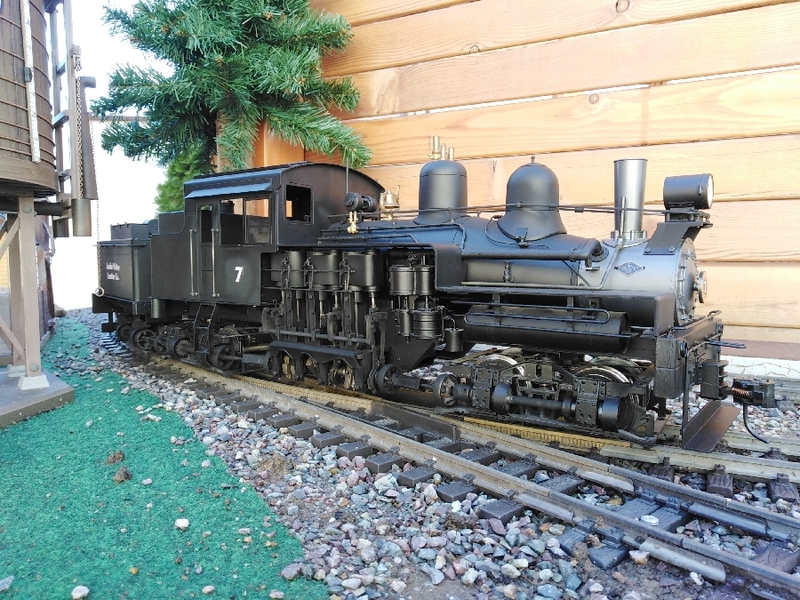 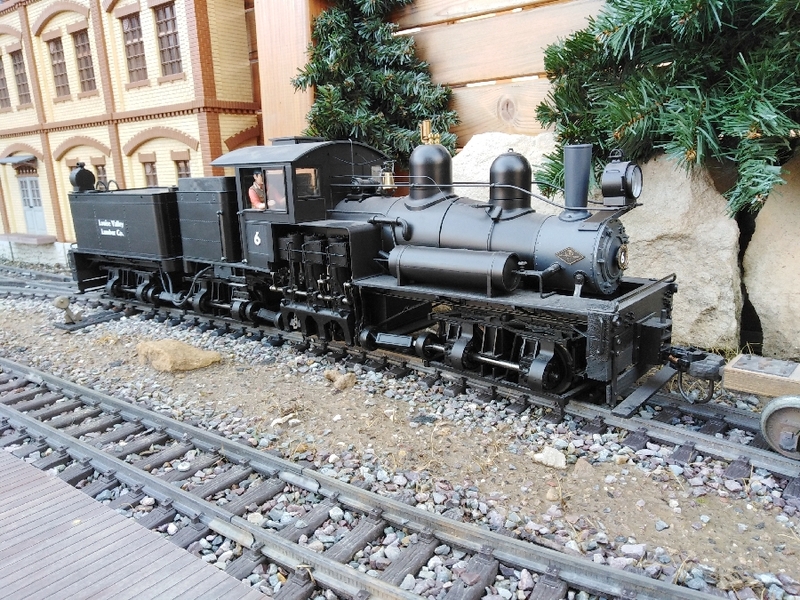 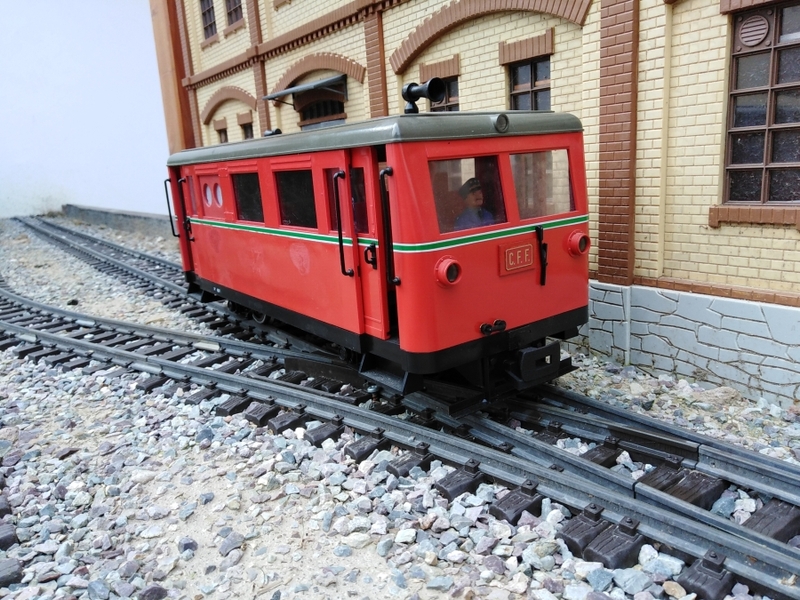 The scale is defined as G-scale, running on 45mm track and uses rolling stock in scale between 1:22.5 and 1:19. 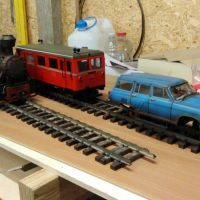 While the space was limited and the layout mostly planed to test new rolling stock, I used R1 curves, which I might not do again on future layouts. 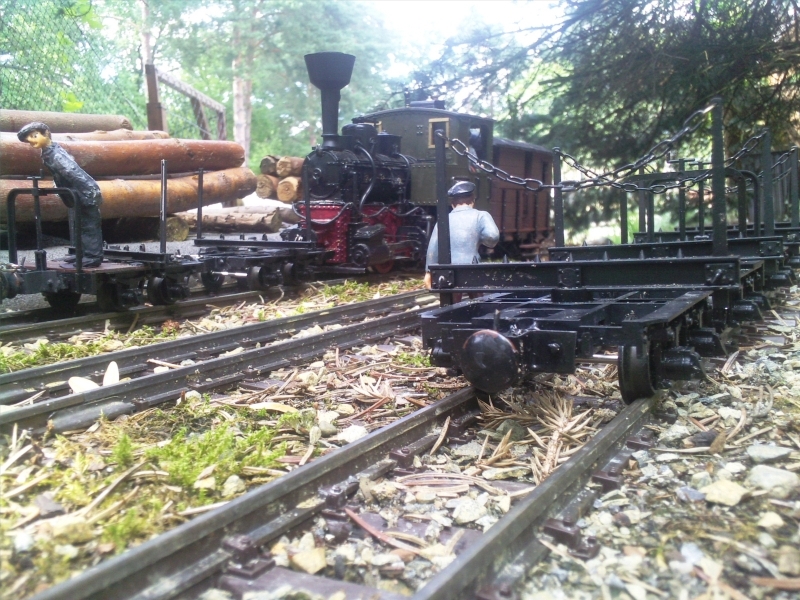 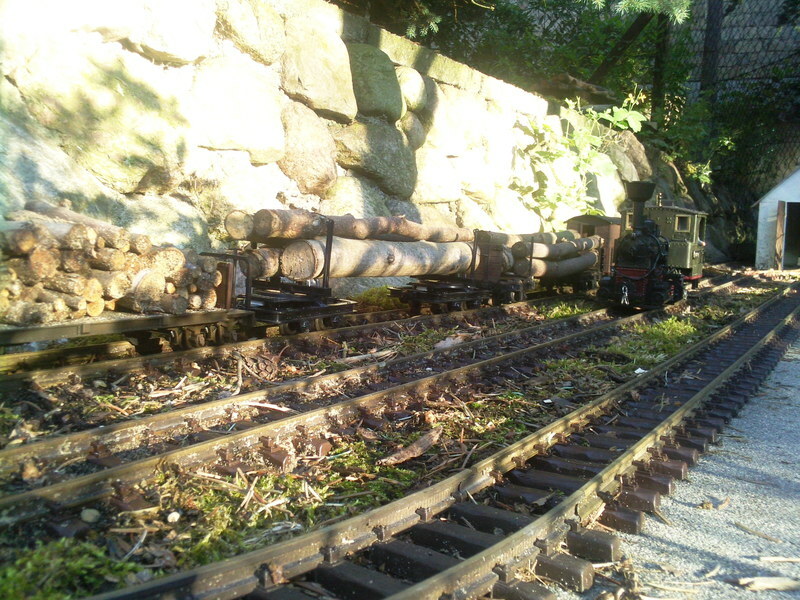 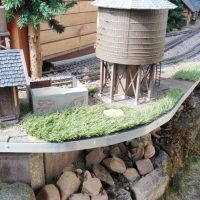 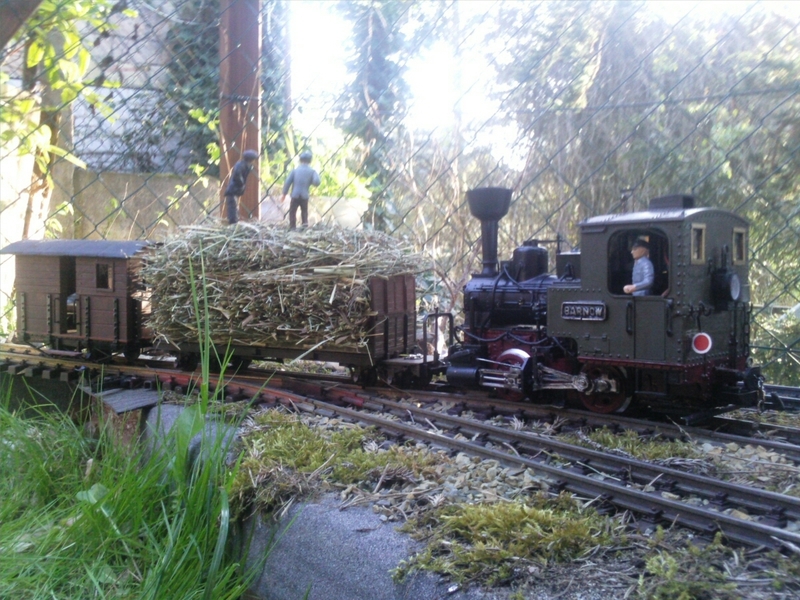 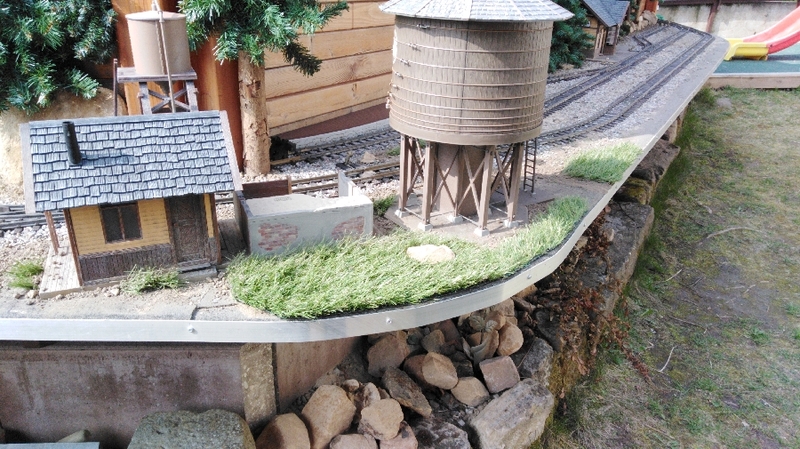 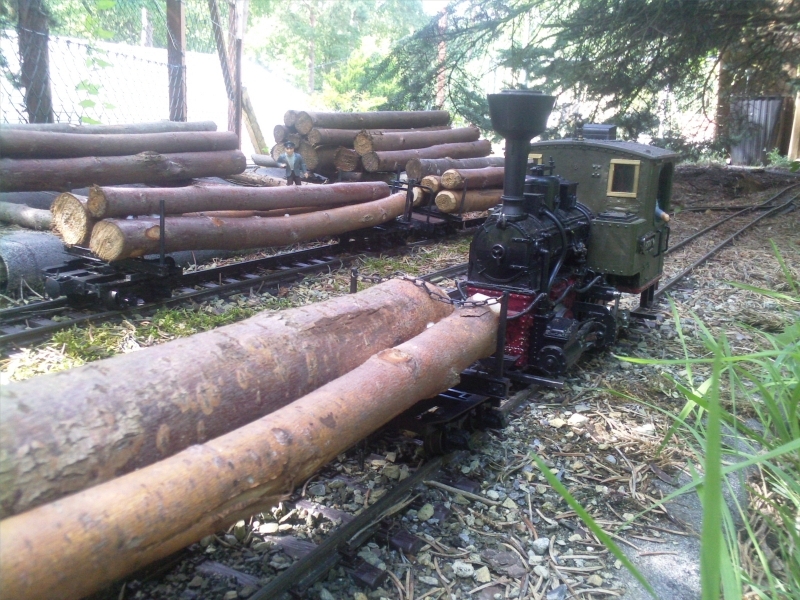 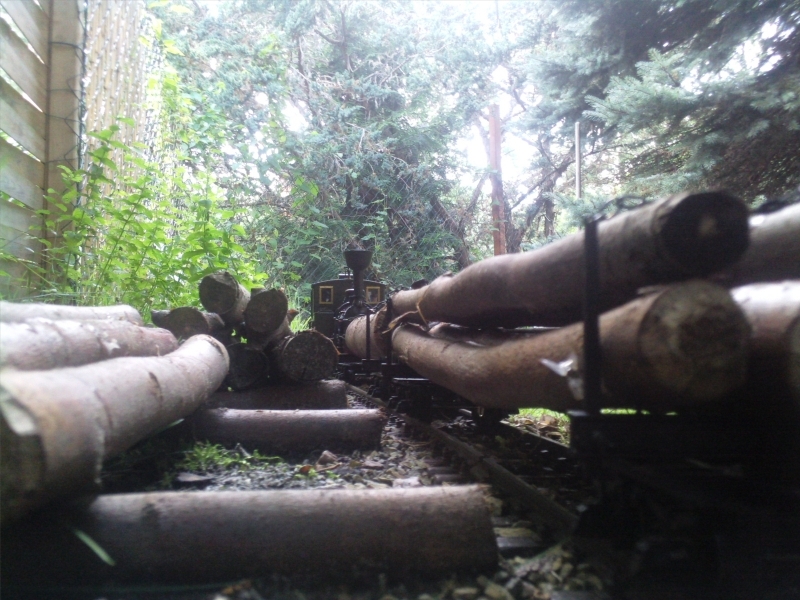 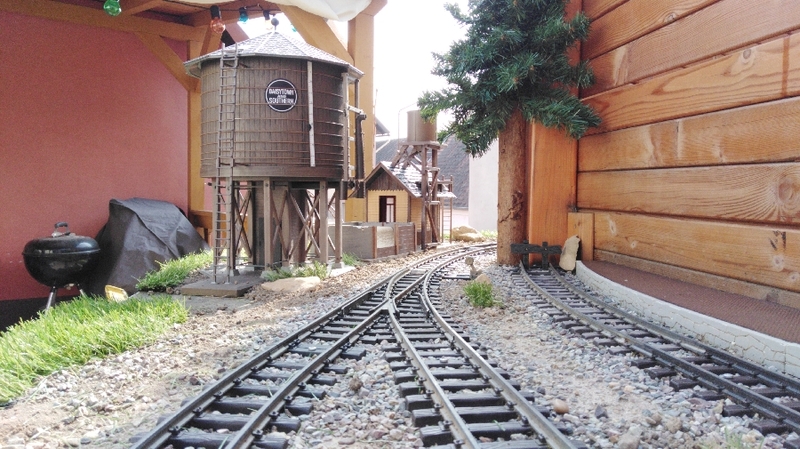 Based on the topography of the garden, the railroad hauls logs from a high plain down to the sawmill/reload station. 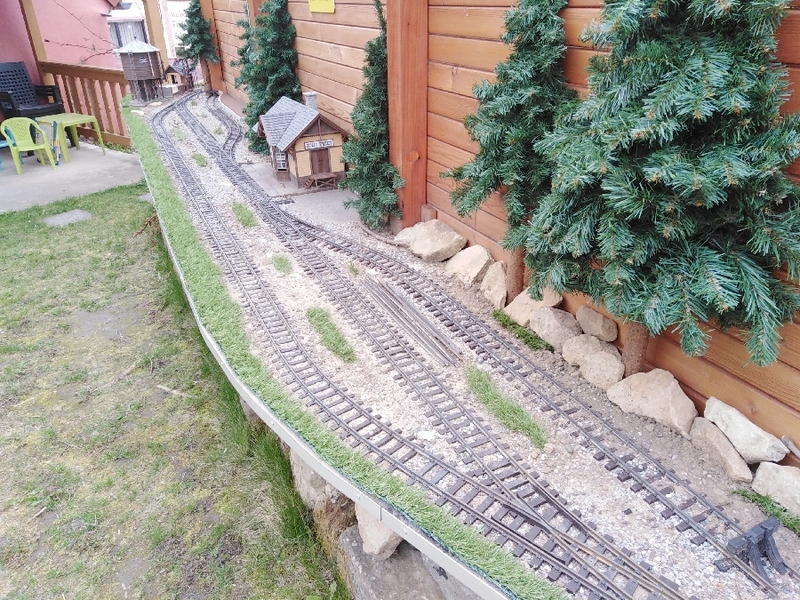 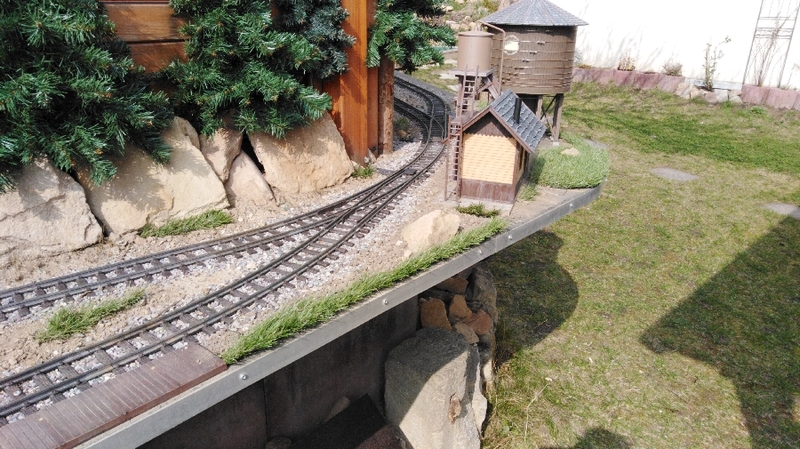 Especially on the lower station, the space is limited, so there are only a few tracks and trackside structures. 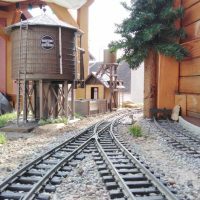 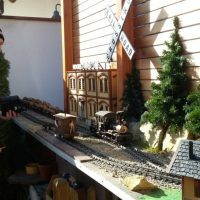 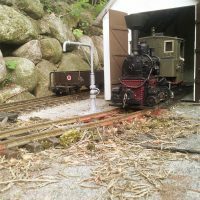 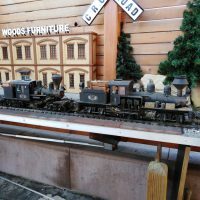 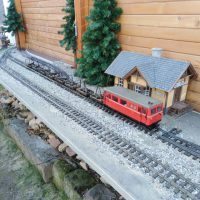 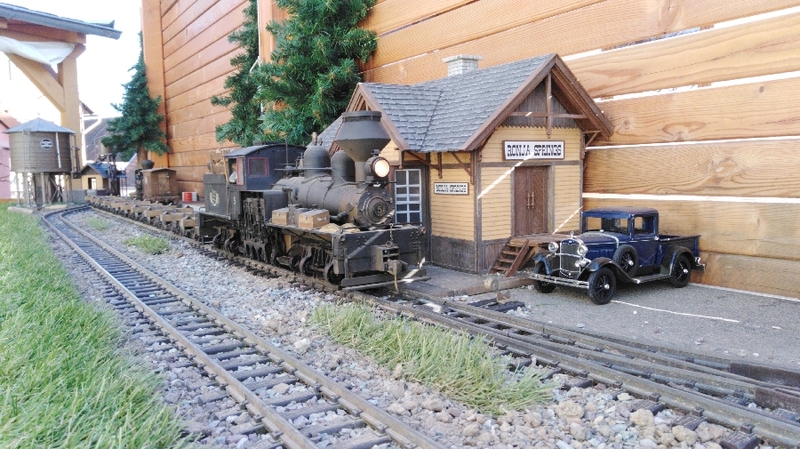 The station only features a runaround track, a long reload siding as well as the engine shed and a short spur at the end of the line. 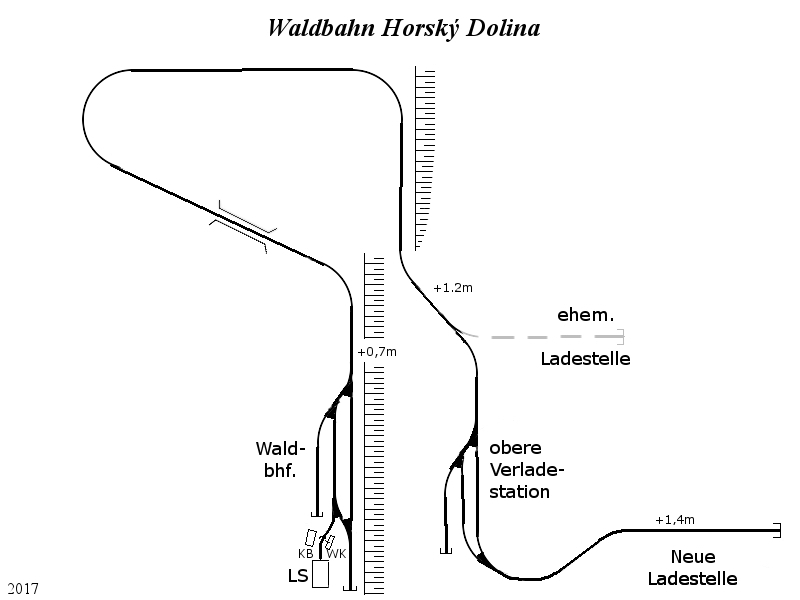 Leaving the lower station, the track runs uphill in a big loop with a 1:10 (10%) grade. 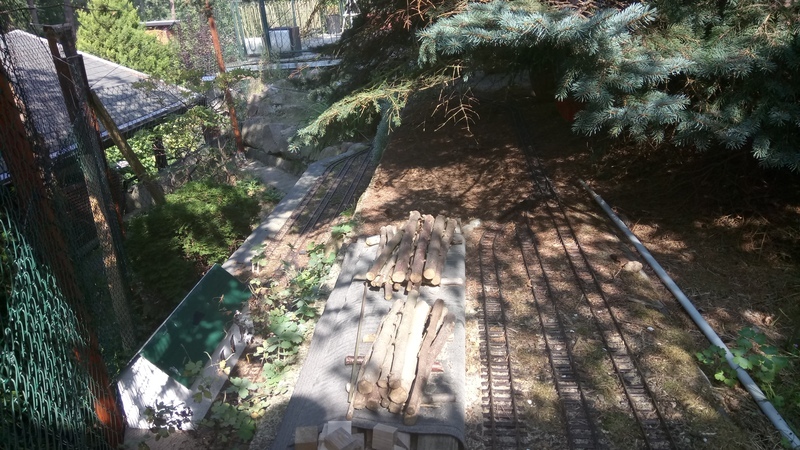 The first loading spur at the top of the grade got abandoned some while ago. 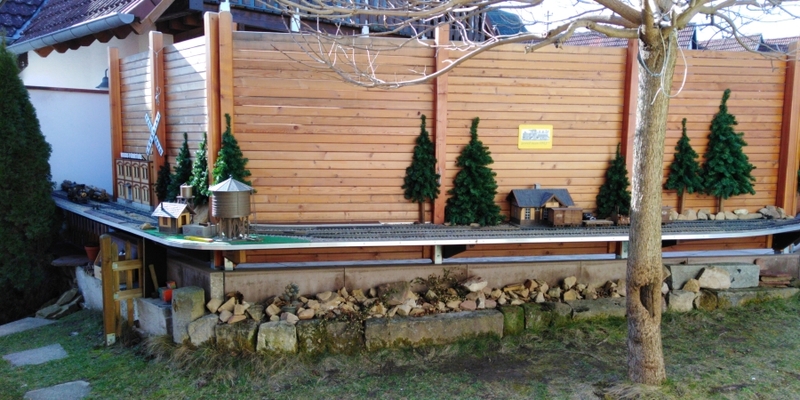 The new loading station is designed for future expansion of the railroad. 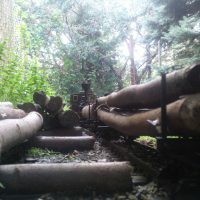 As seen on some logging railroads, I like to operate trains from this station, which pushes empty log cars to the final loading places in the woods. 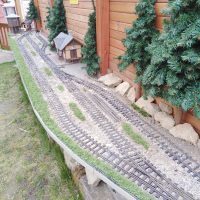 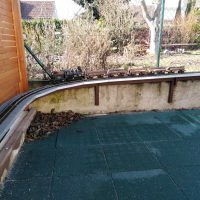 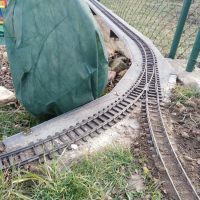 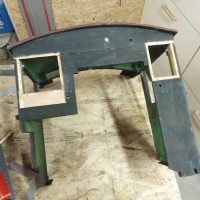 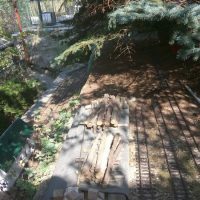 Well, here are some photos and a track plan. 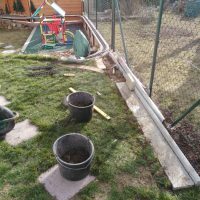 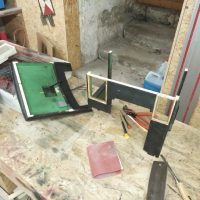 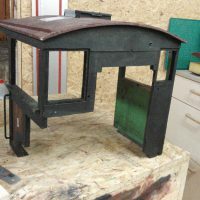 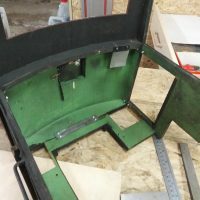 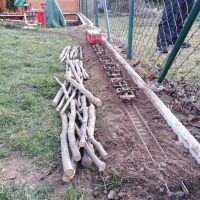 More photos and build logs are posted in the origin forum thread at Stummi-Forum (visible without login).